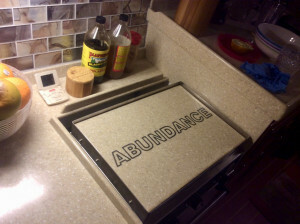 ‘Abundance’ is certainly aptly named. 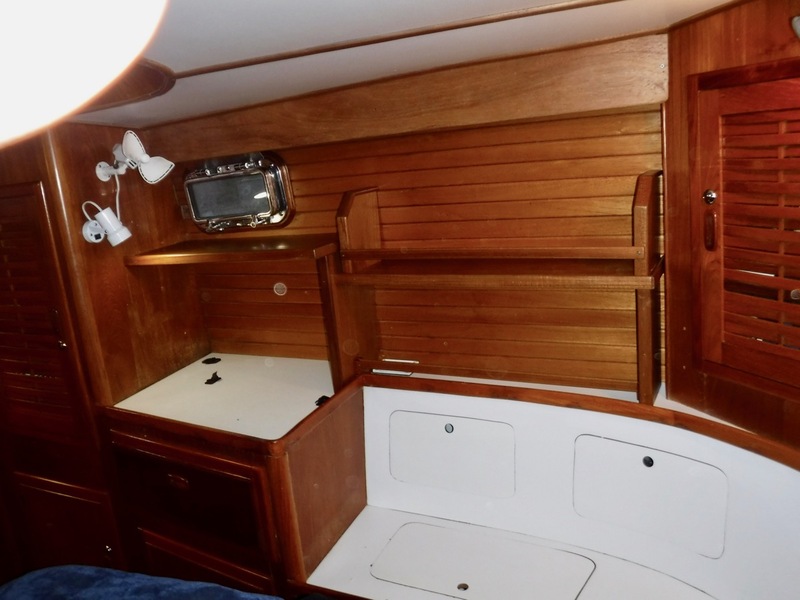 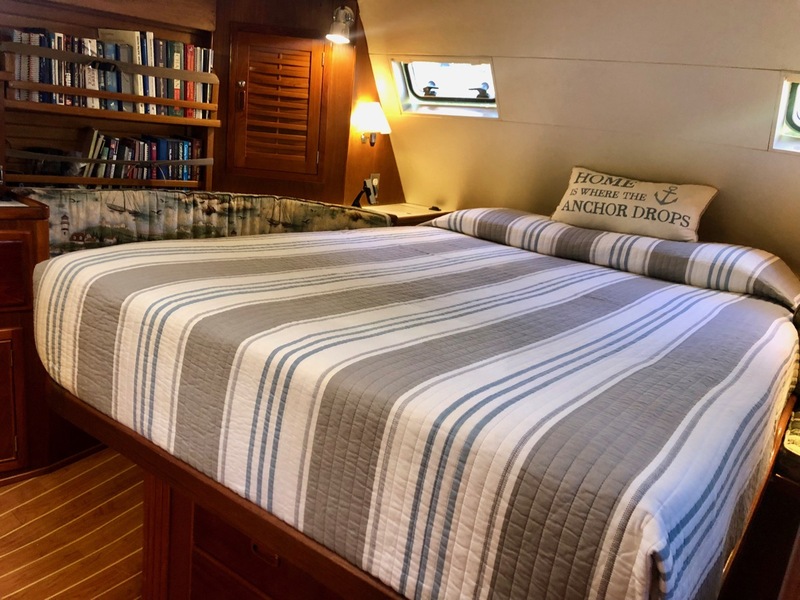 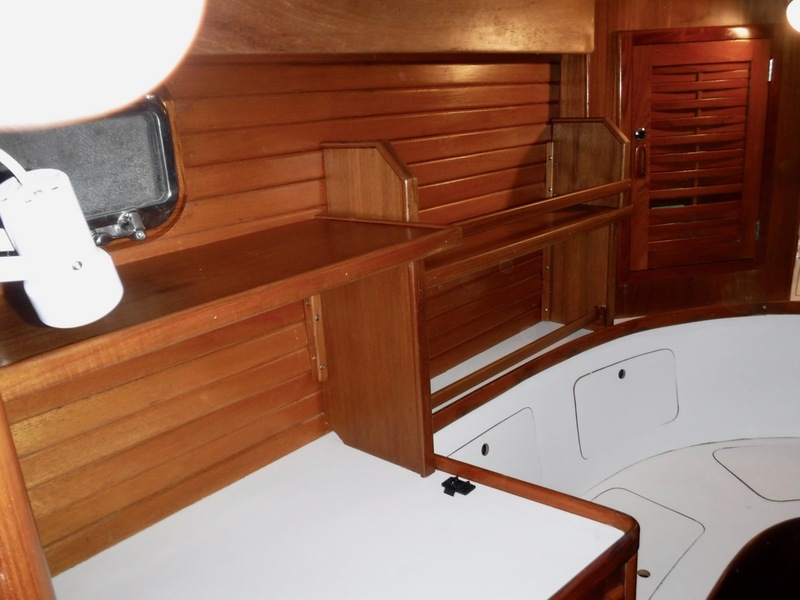 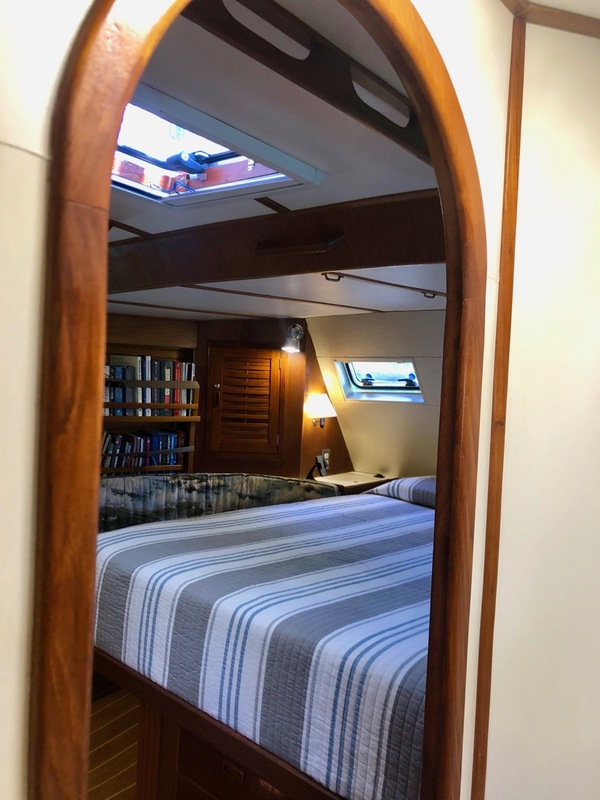 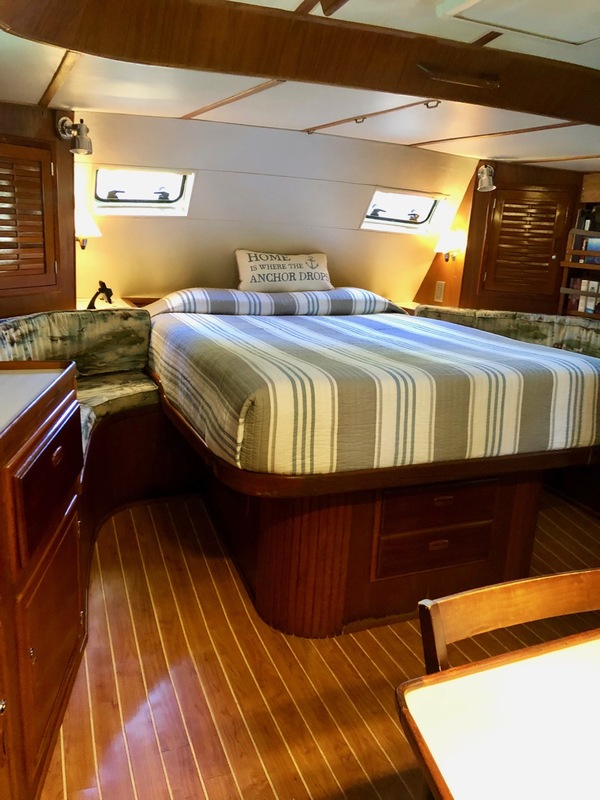 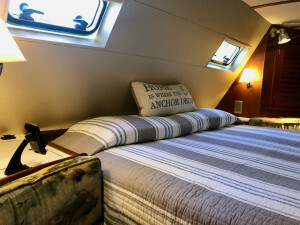 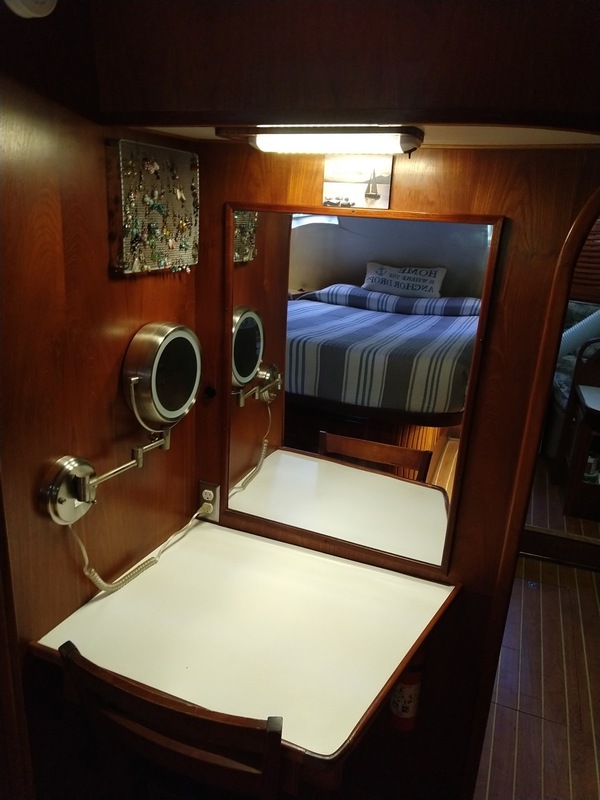 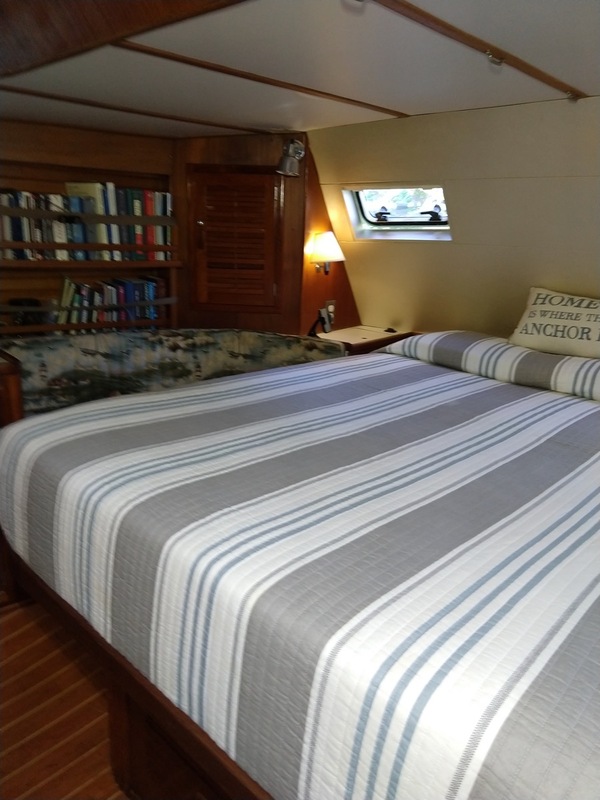 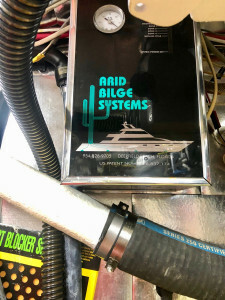 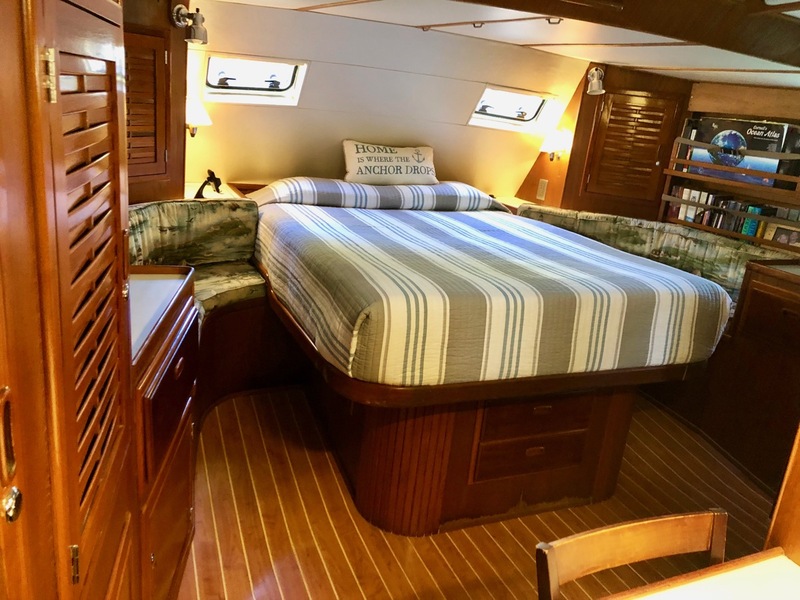 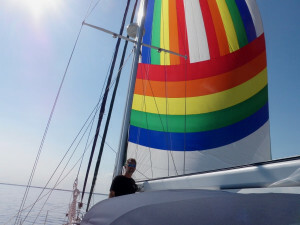 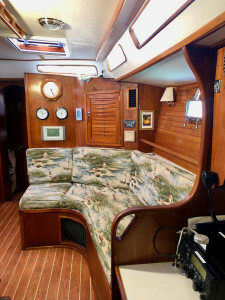 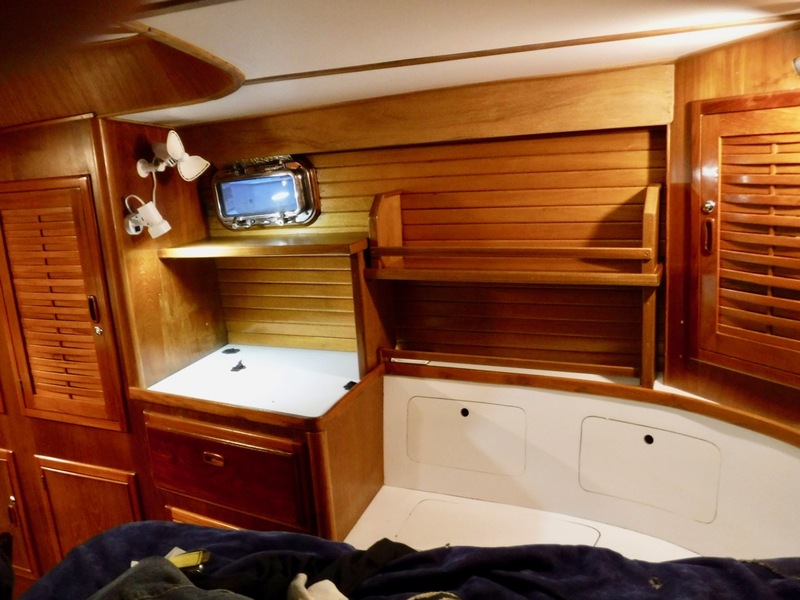 Brainchild of Bill Ashmead, a talented designer and boat builder, she was lavished with every attributes one can think of, from her sea-kindly lines to her incredibly comfortable interior. 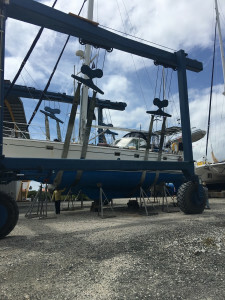 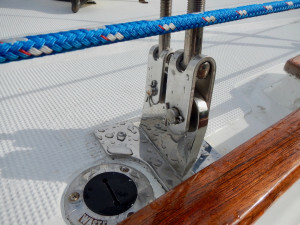 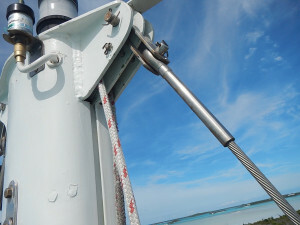 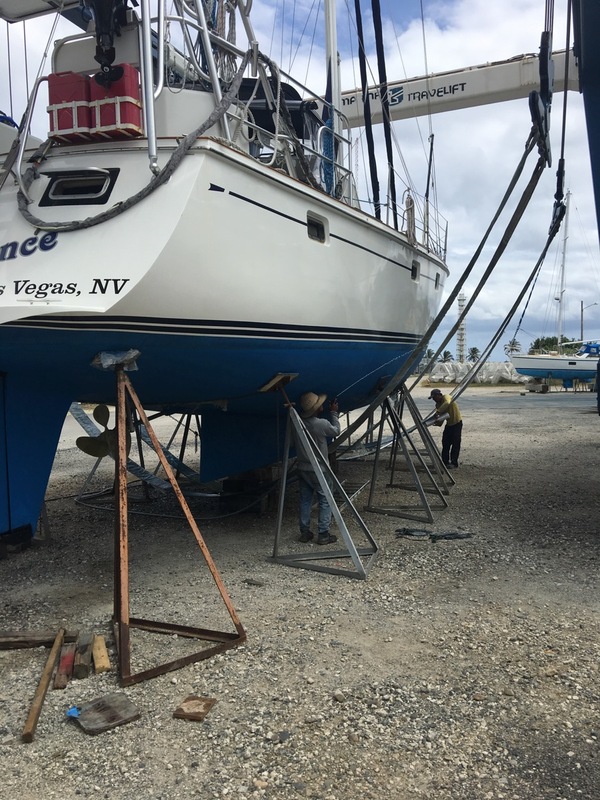 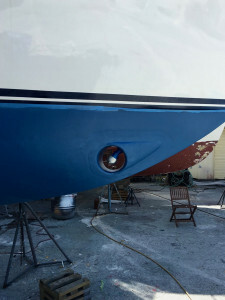 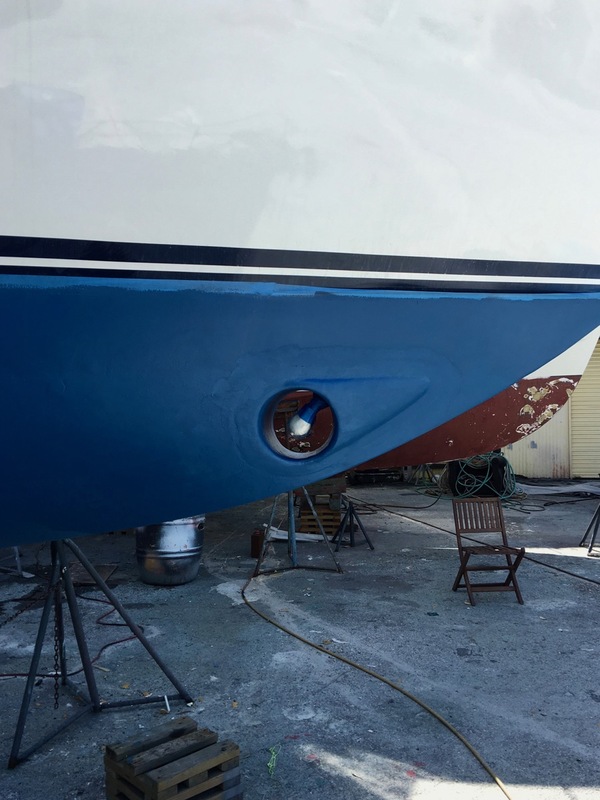 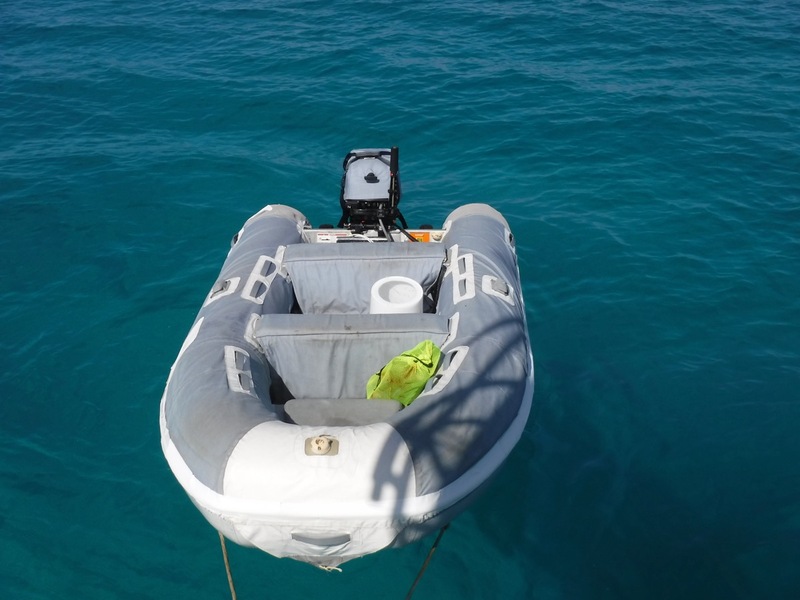 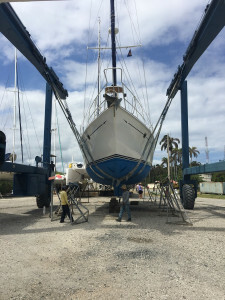 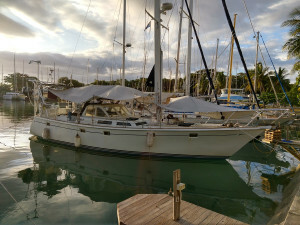 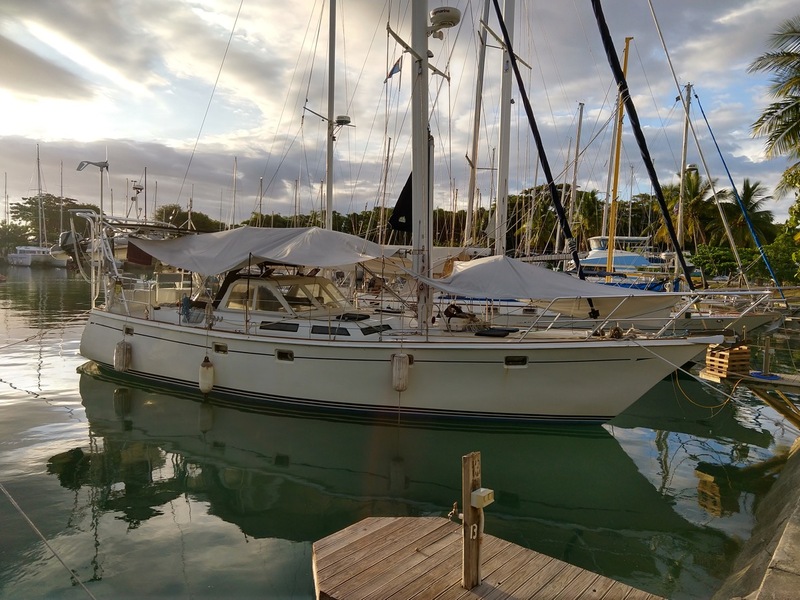 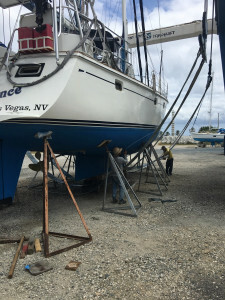 In fact, in years as cruisers ourselves and later as cruising yacht specialists, we have rarely seen a boat designed and built so carefully and equipped so thoroughly. 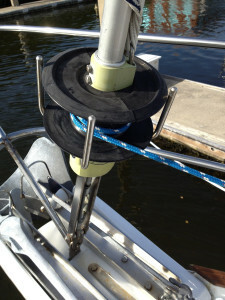 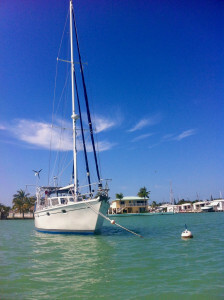 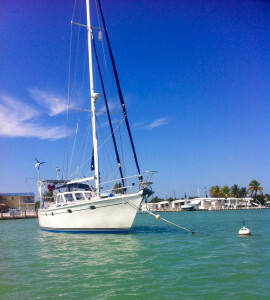 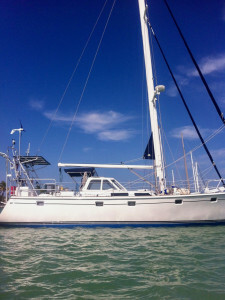 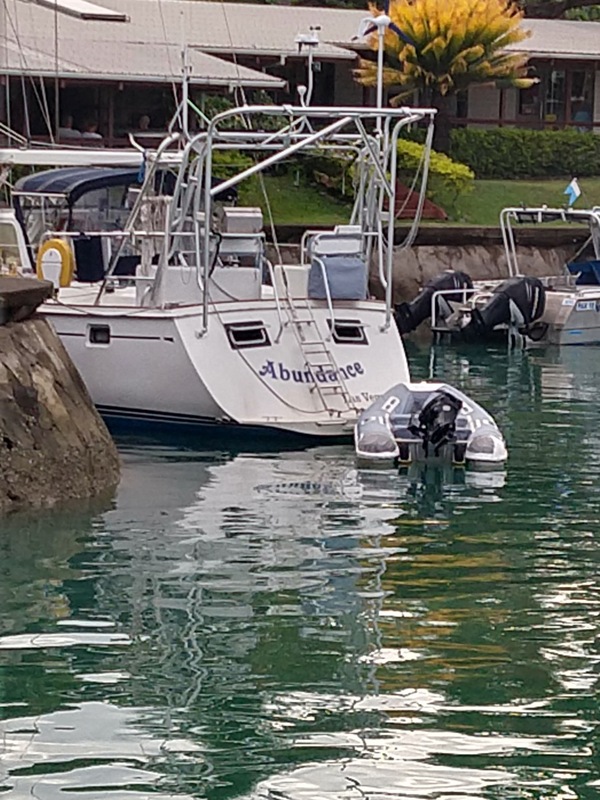 First, the look: ‘Abundance’ is not the sort of boat that you walk past without noticing. 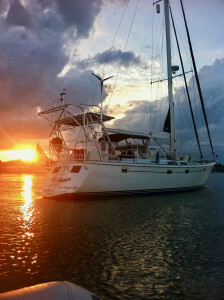 She simply gleams, shows her loving upkeep from every angle. 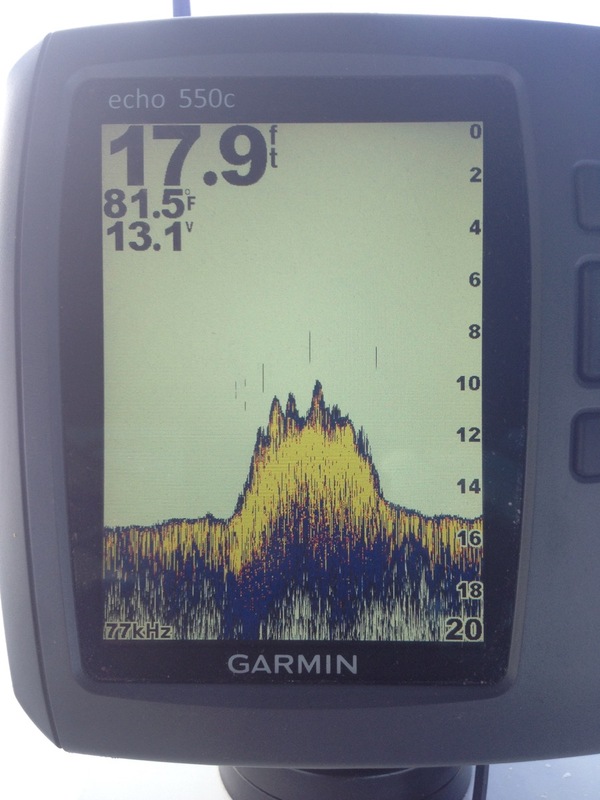 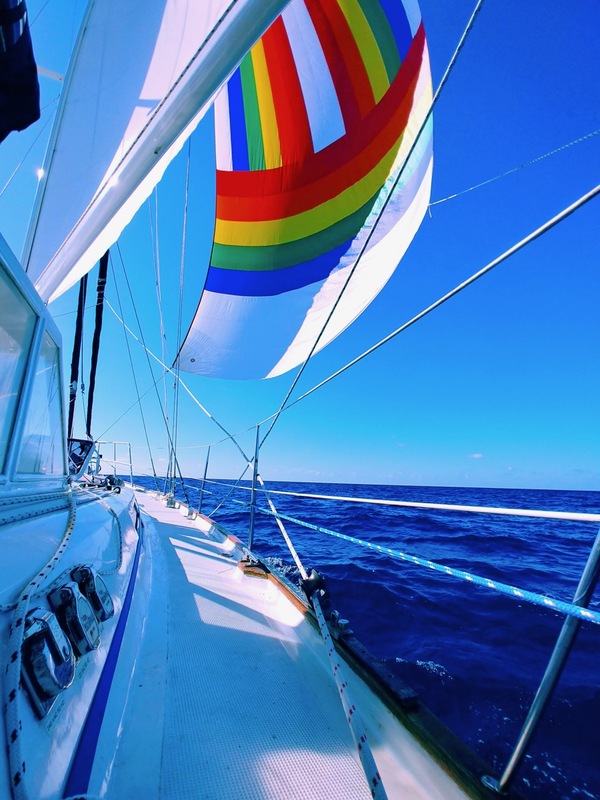 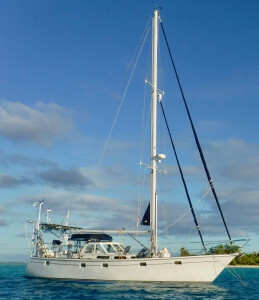 Her lines have that imposing, yet elegant shape that speaks of power and comfort and of ocean voyages. Sitting proudly at Vuda Marina amongst a hundred other cruising yachts hailing from all corners of the earth, ‘Abundance’ certainly has the ‘wow factor’. 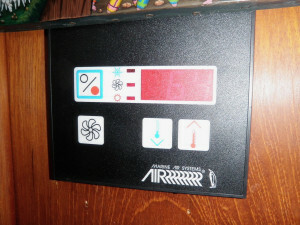 Second, the design, which is pure genius. 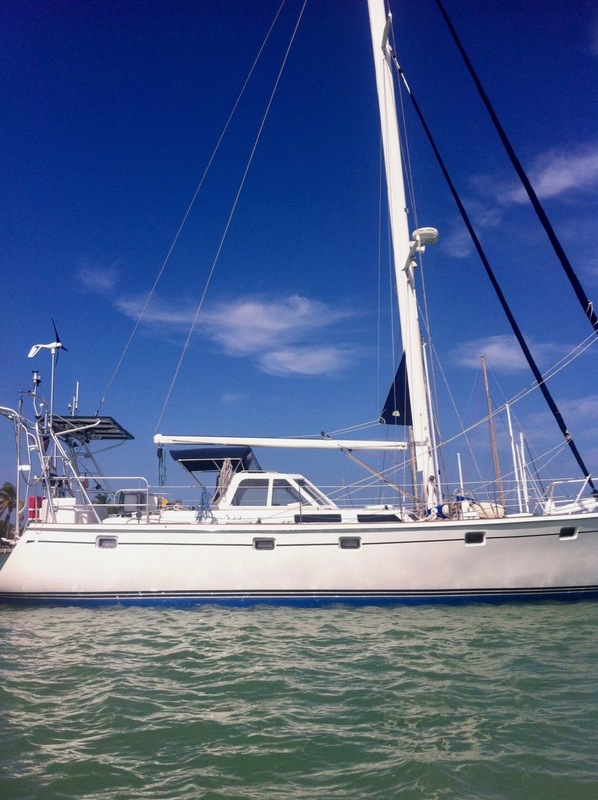 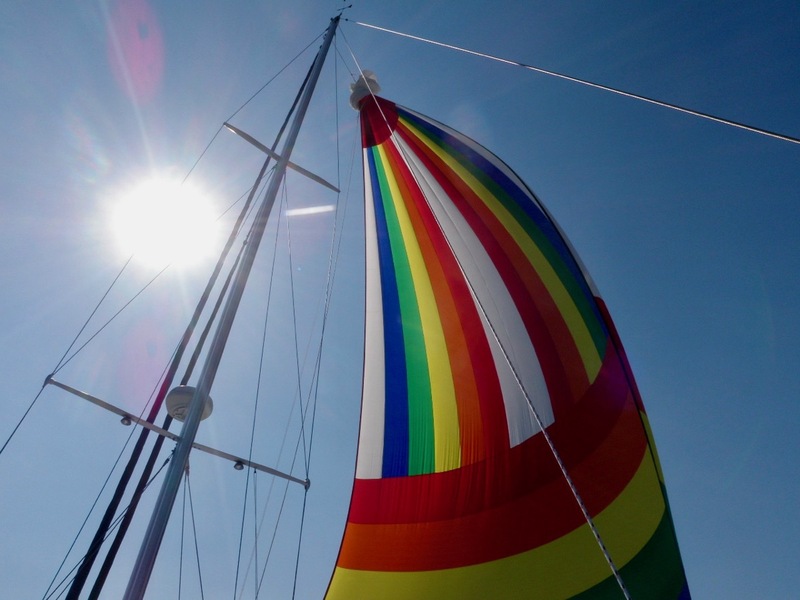 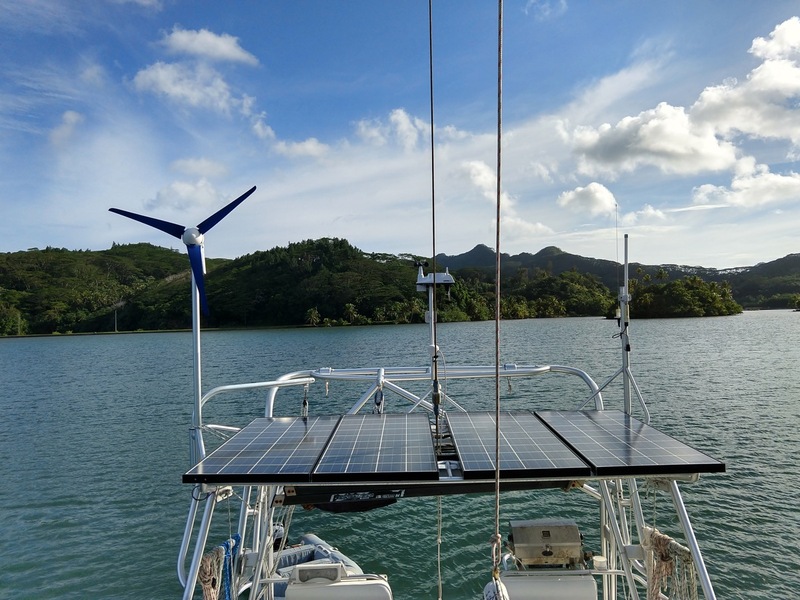 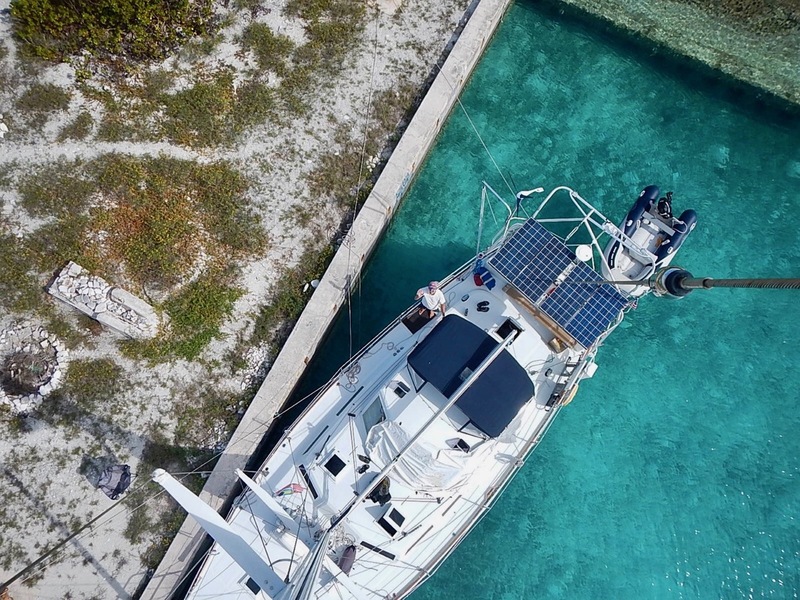 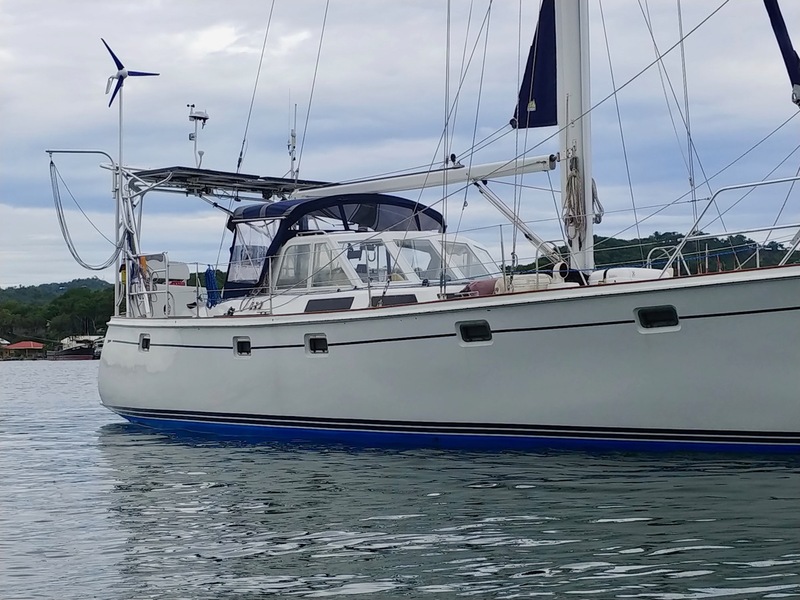 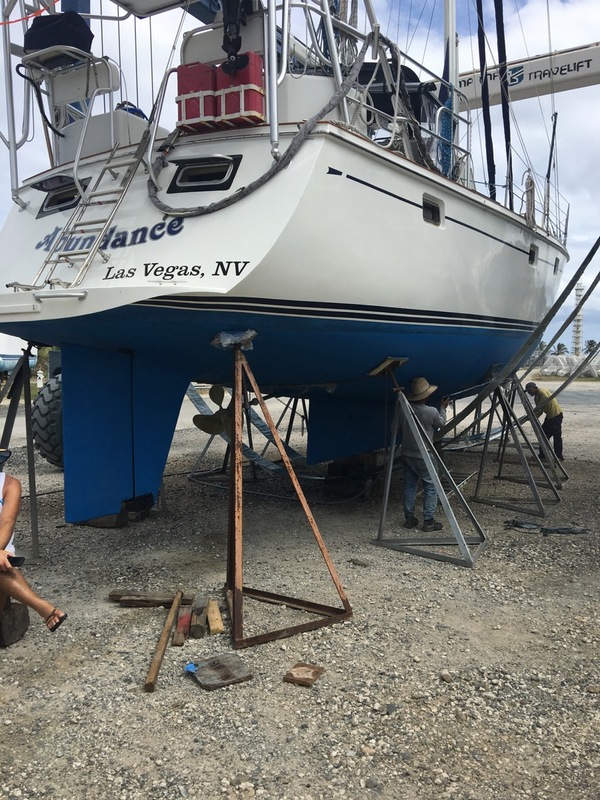 With a lifting keel (easily handled centre-board conveniently reducing the draft to a mere 5’ perfect for accessing shallow anchorages, to a mighty 11’ when you need to point high into the breeze, ‘Abundance’ gives you the best of both worlds. 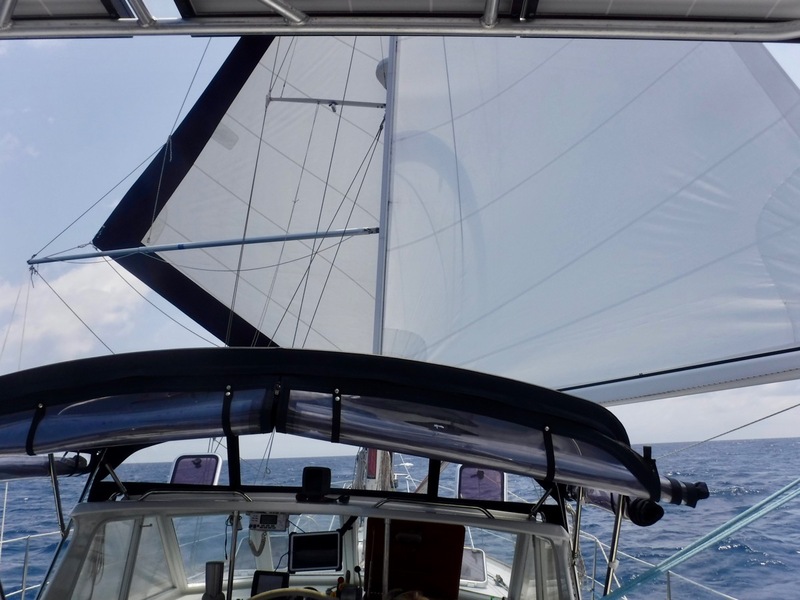 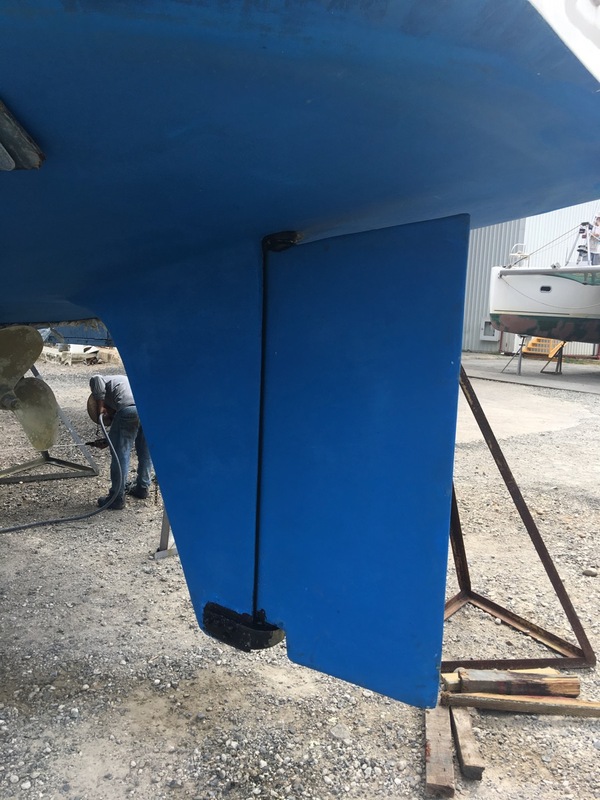 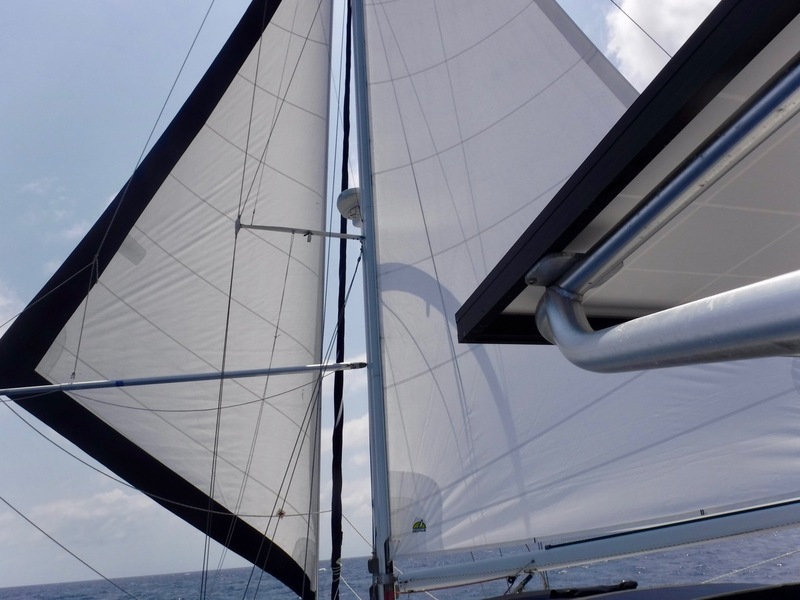 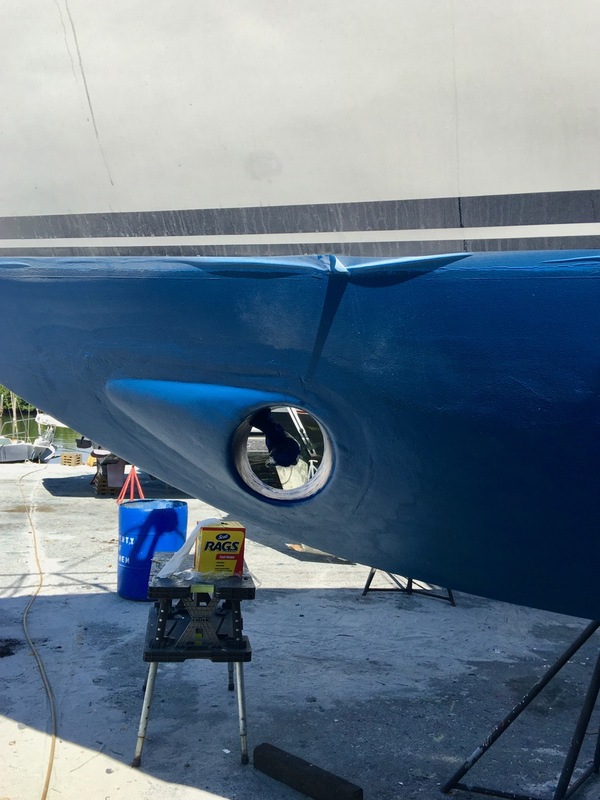 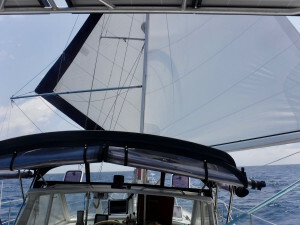 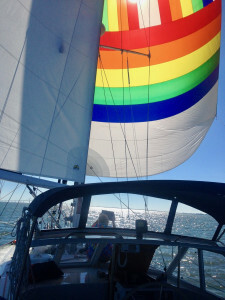 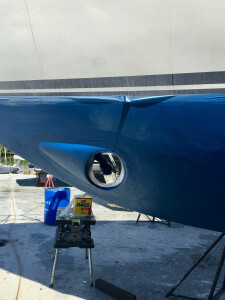 With a semi displacement hull that is well rounded forward of the keel, she will cut through the swell without slamming, (as every modern production boat is prone to do), yet will give you a generous turn of speed at all wind angles. 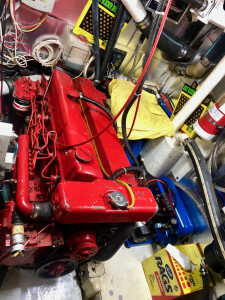 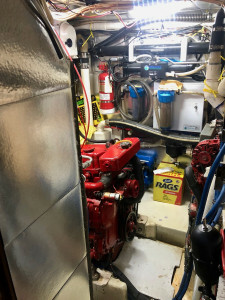 Furthermore, the engine is situated in a veritable engine room, almost as big as what you would expect from a power cruiser. 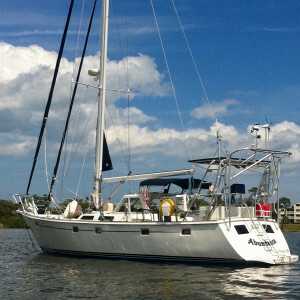 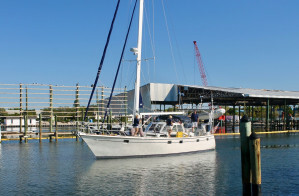 Her high decks will stay dry well after everyone else's is awash with water, and her transom is high, which is safer than modern boat’s open transoms, on which following seas can sometimes climb yet is equipped with a sugar scoop that is an ideal swim / landing platform which makes boarding easy and safe. 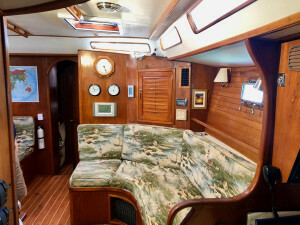 The saloon, curving over a beautiful varnished table sits opposite a lovely sitting area and a beautifully crafted and very convenient navigation area. 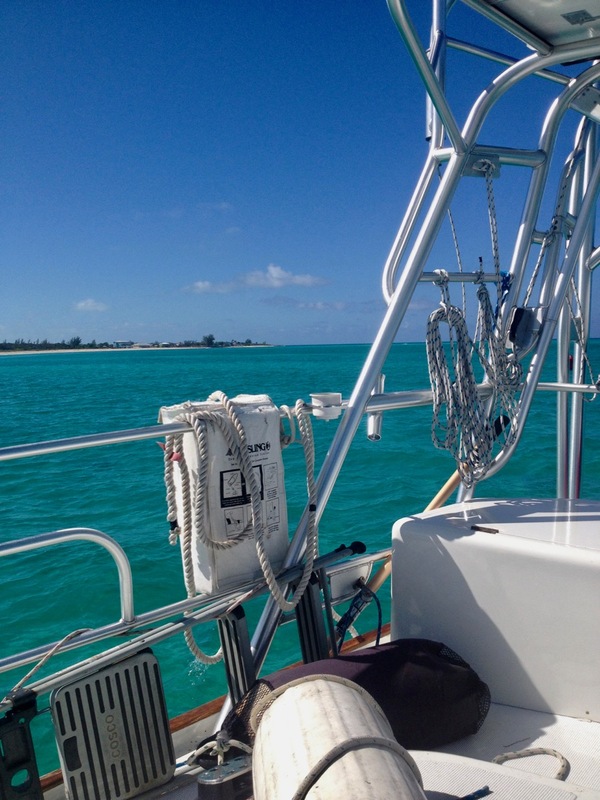 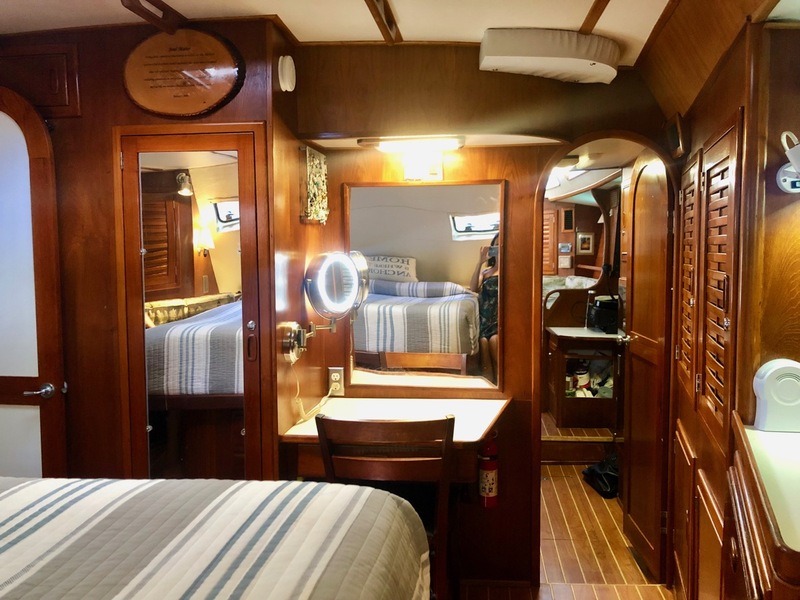 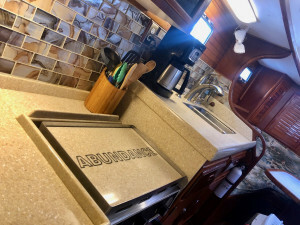 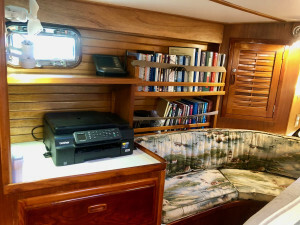 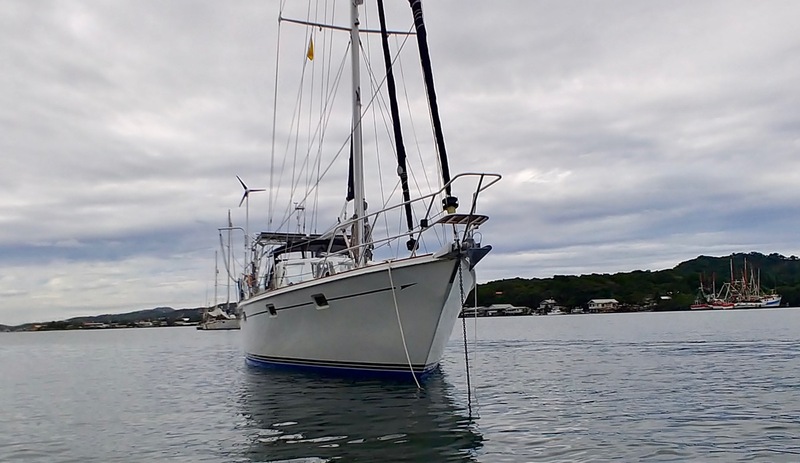 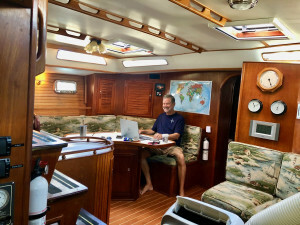 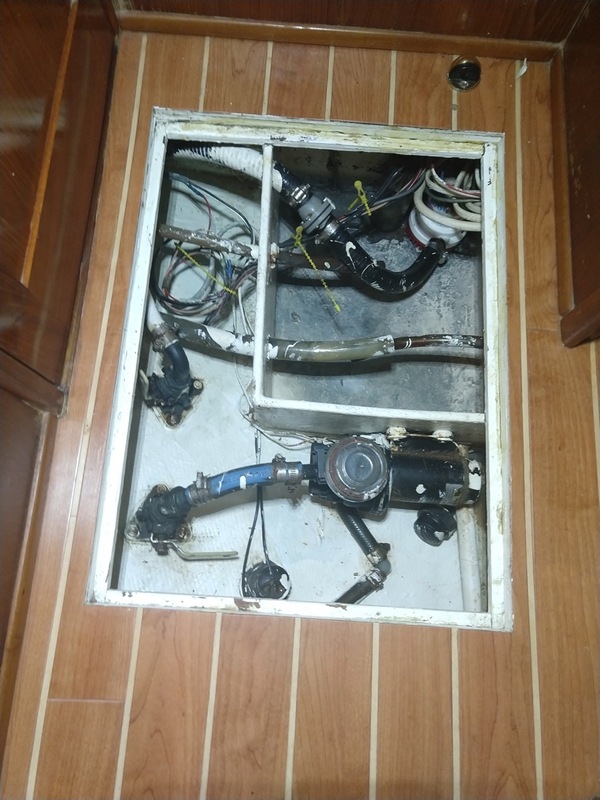 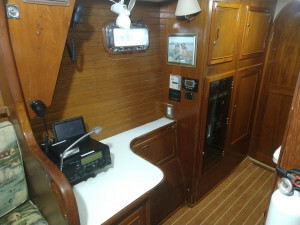 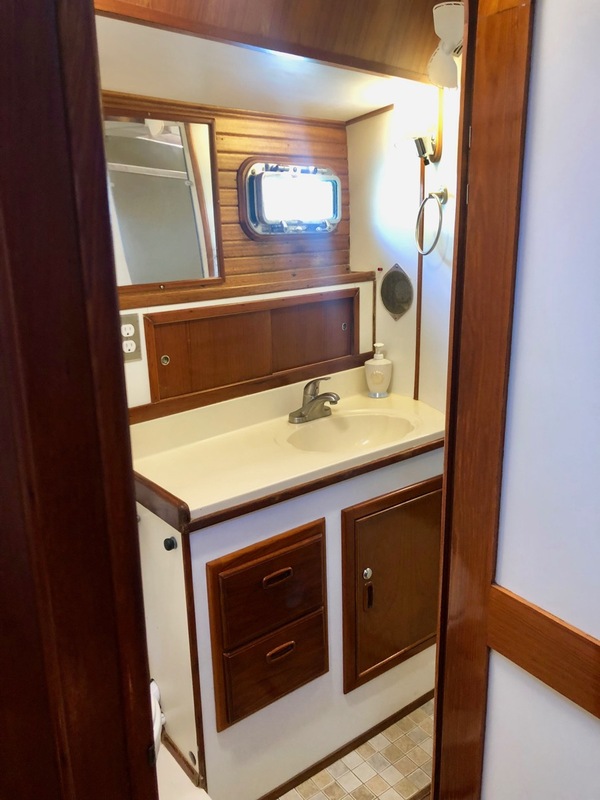 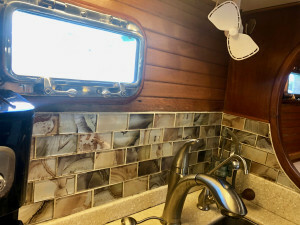 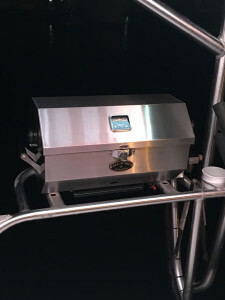 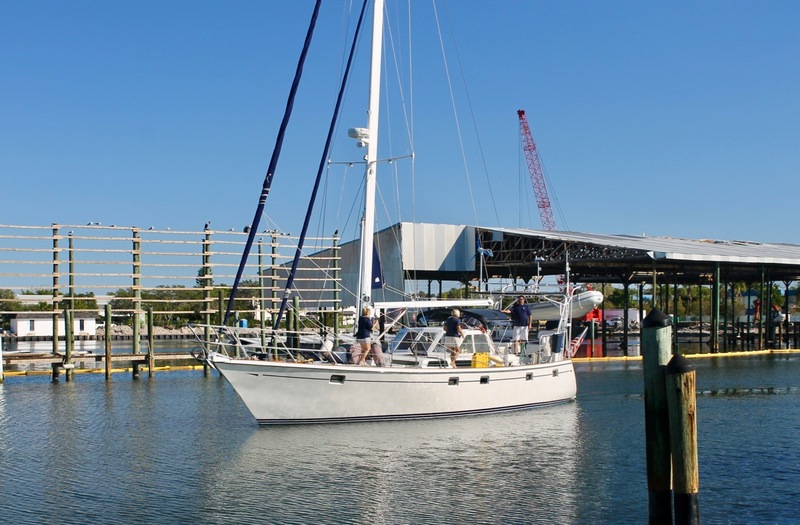 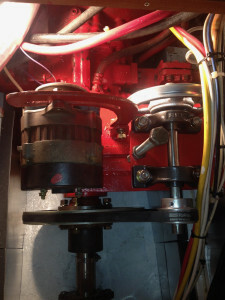 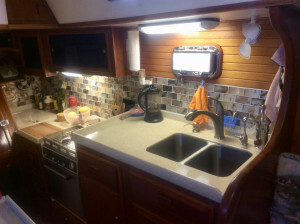 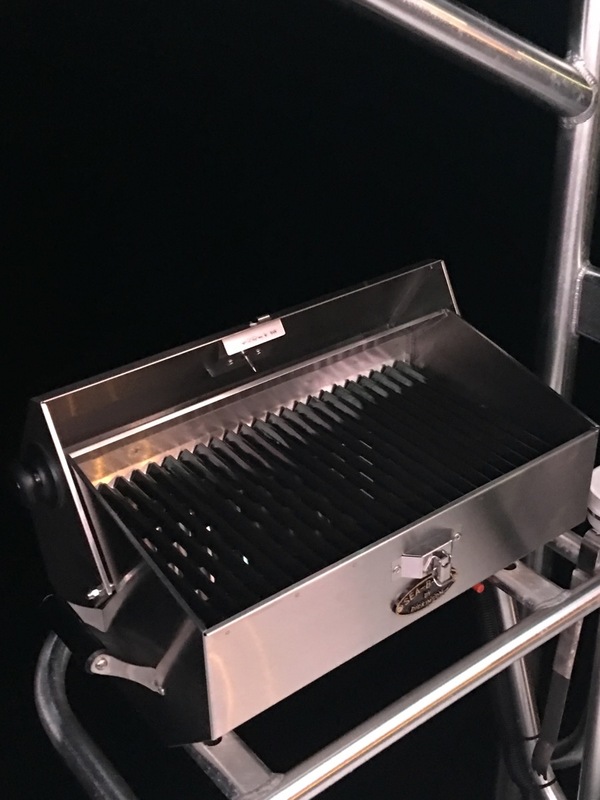 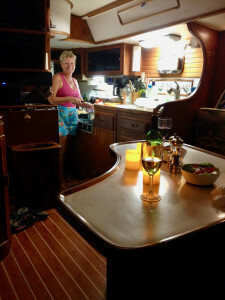 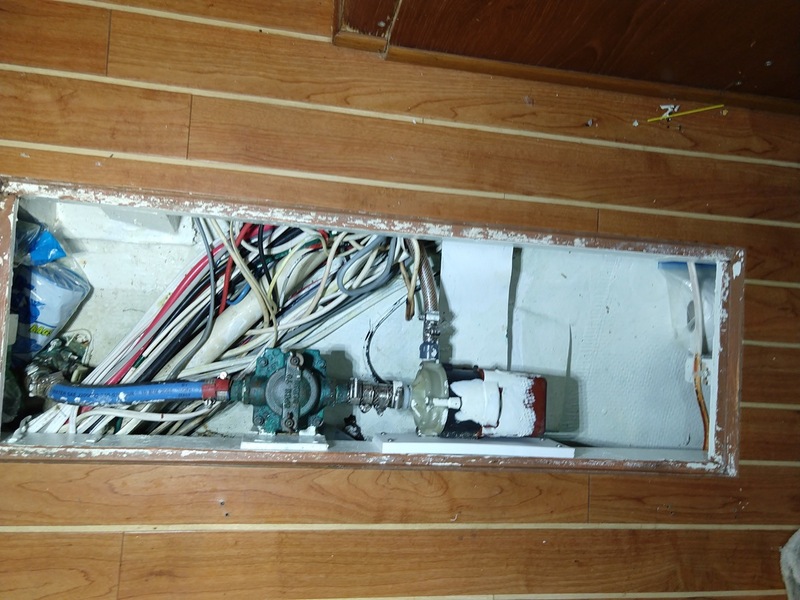 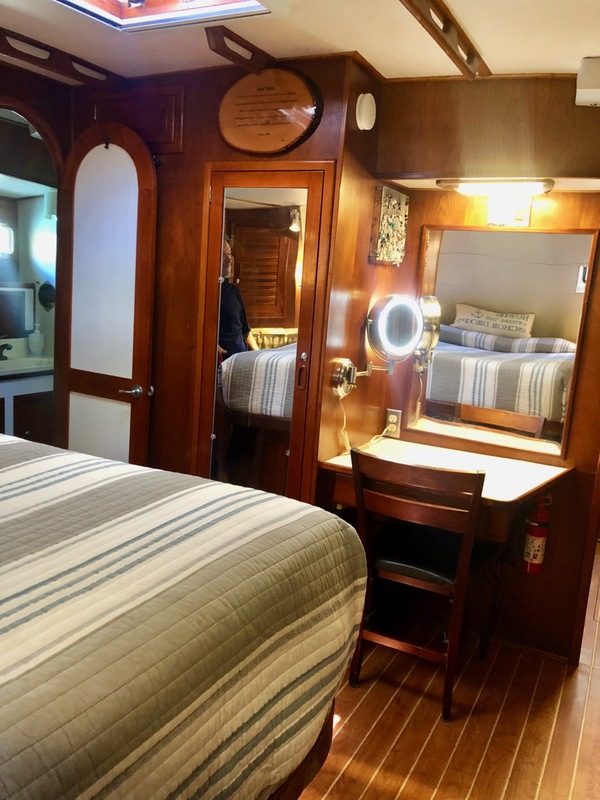 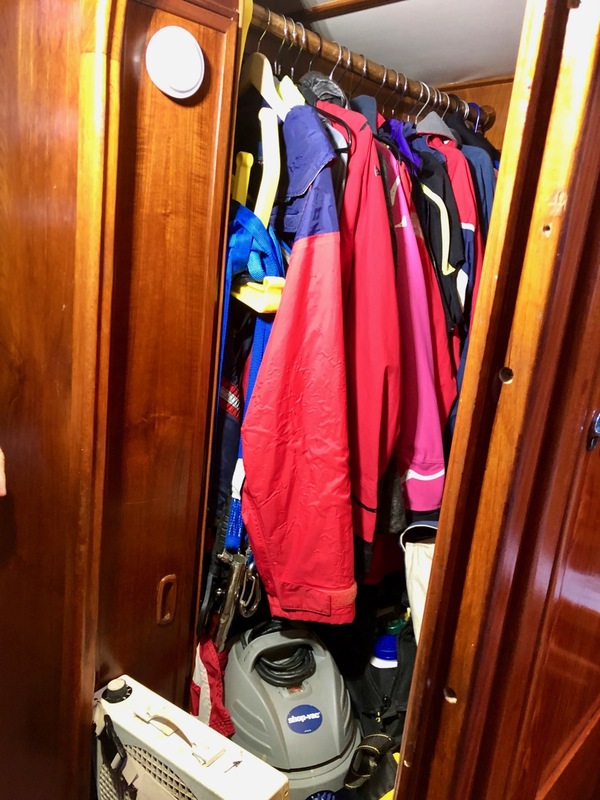 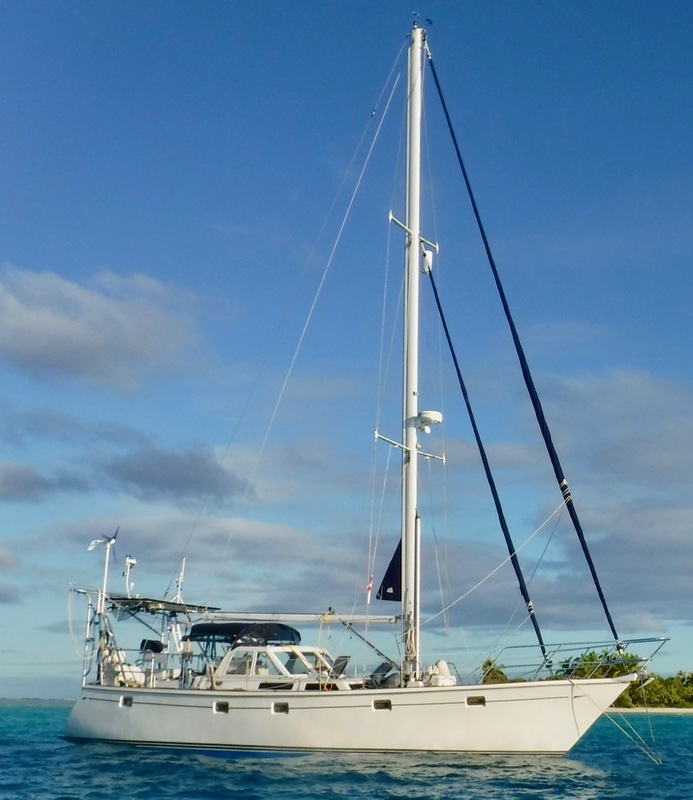 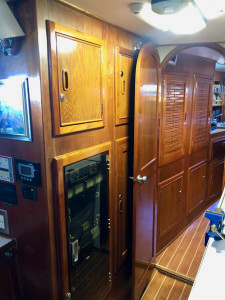 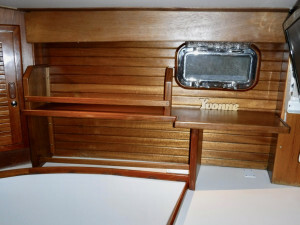 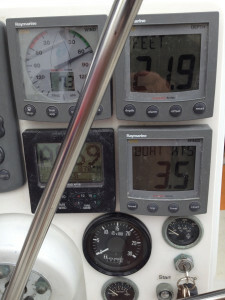 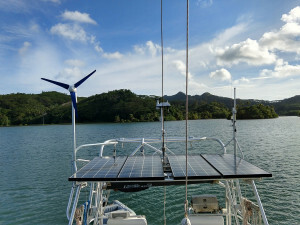 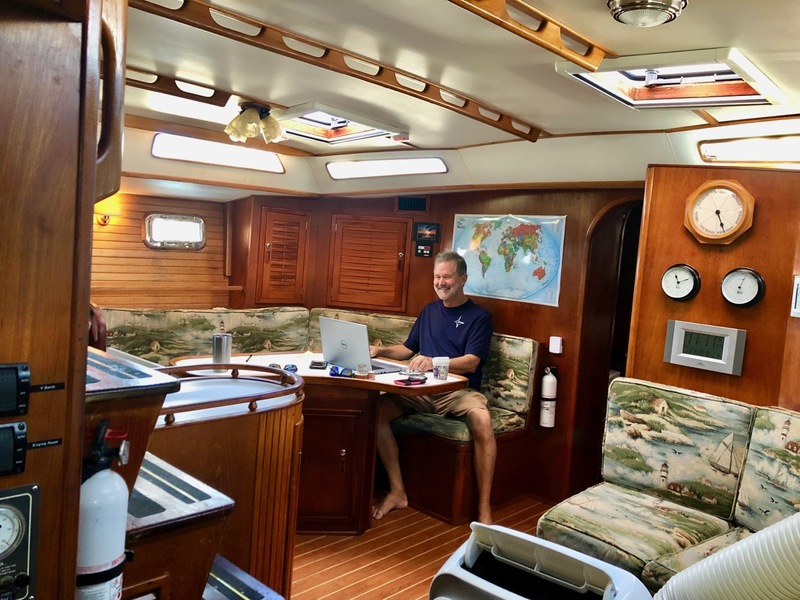 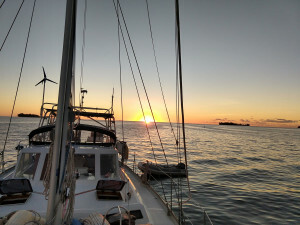 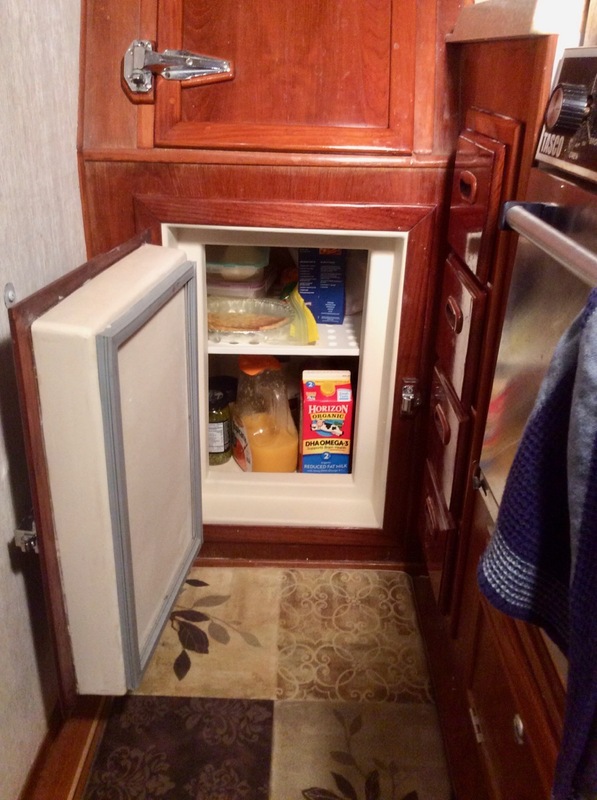 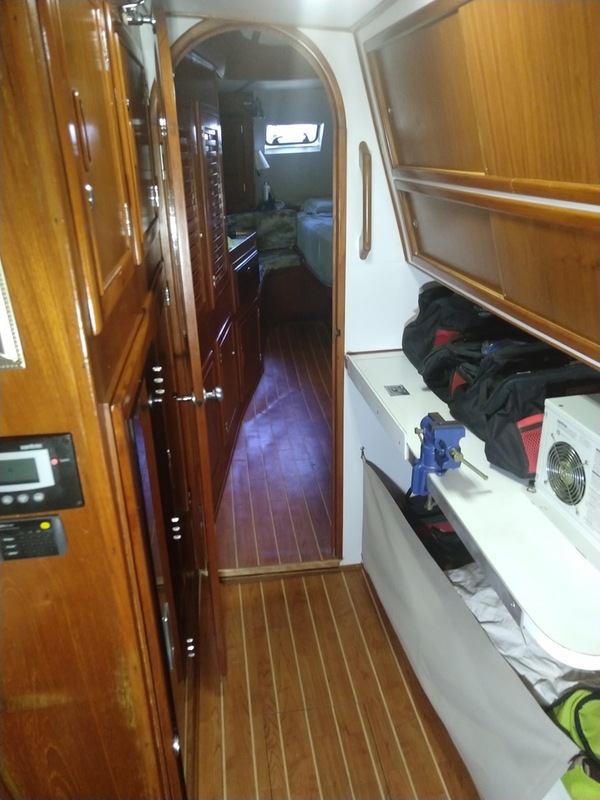 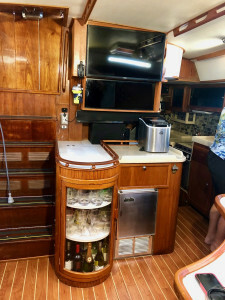 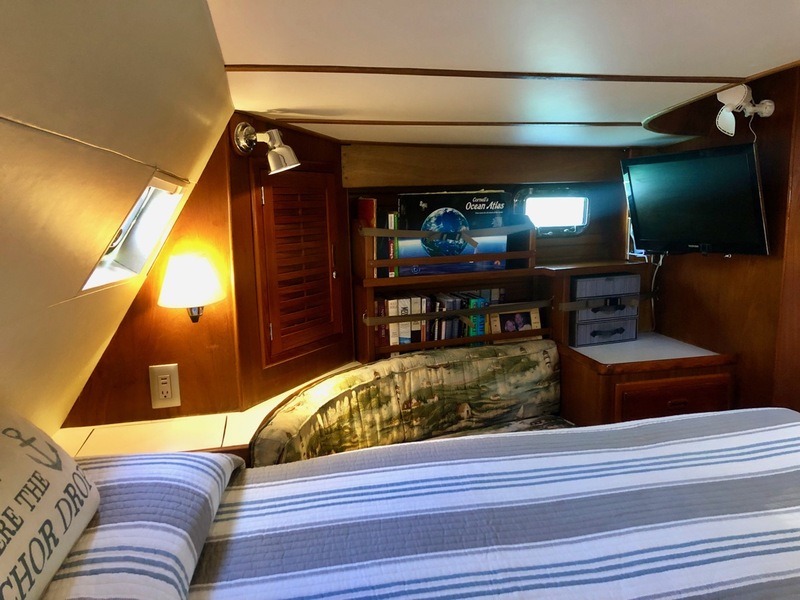 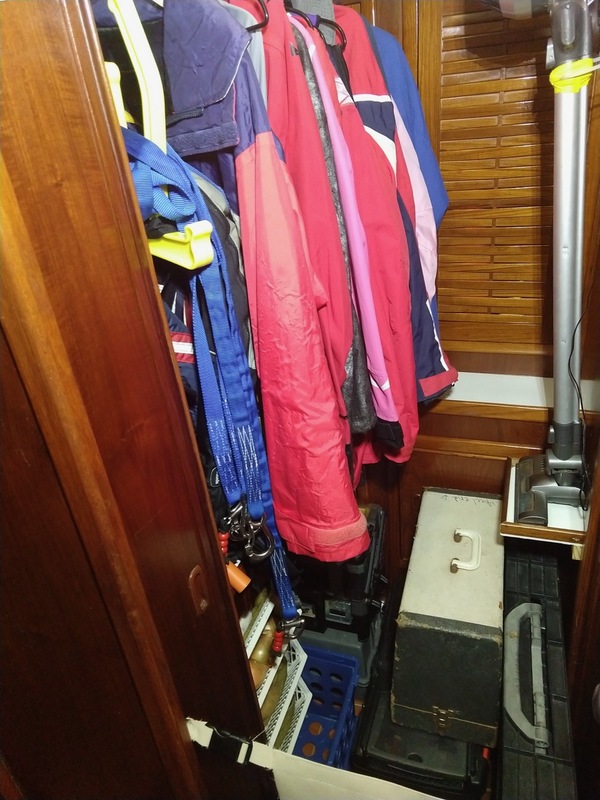 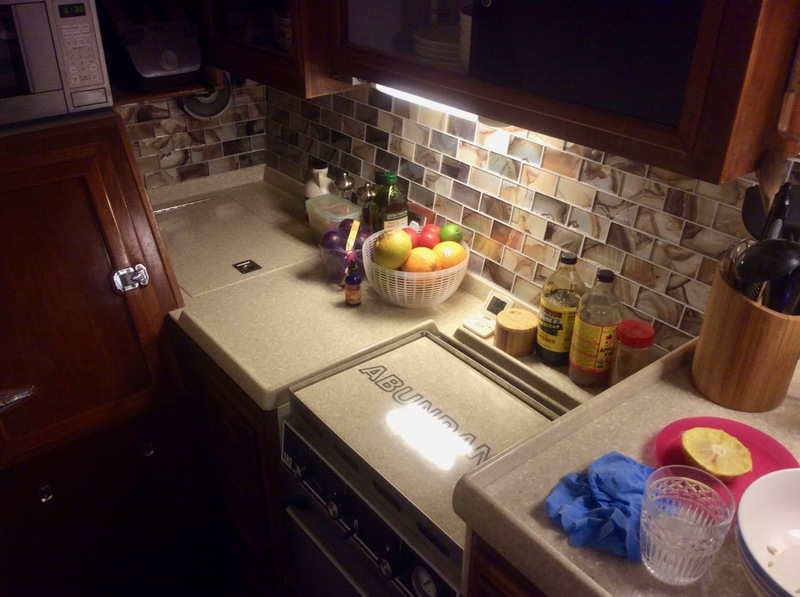 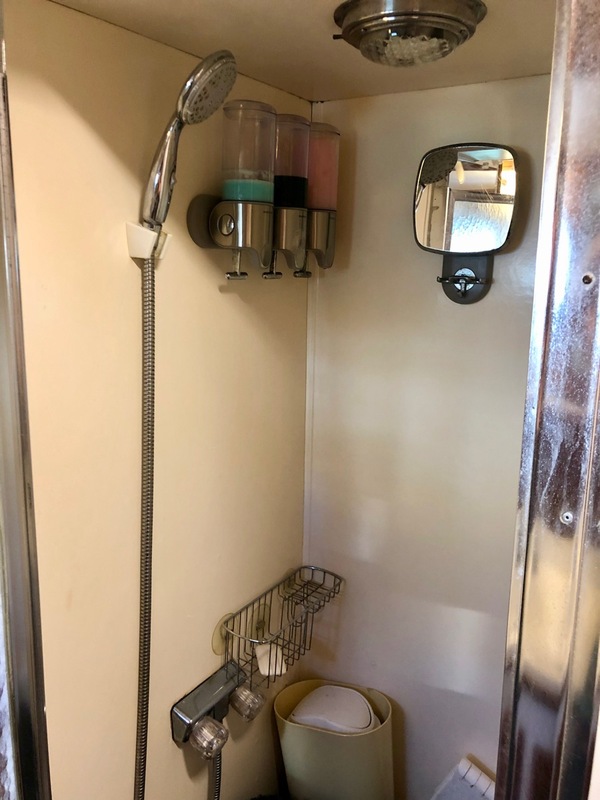 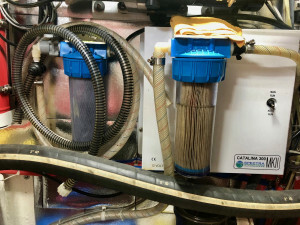 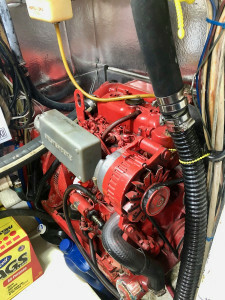 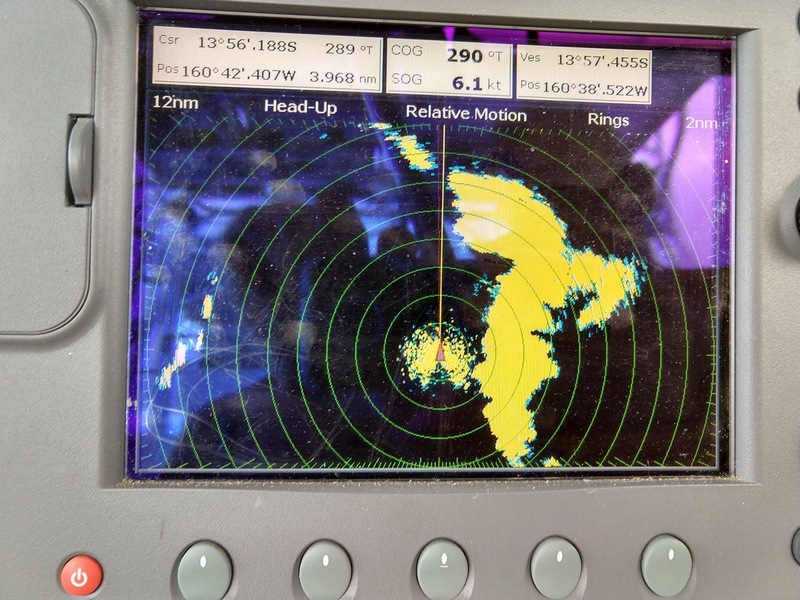 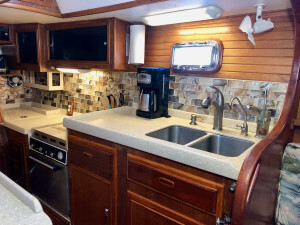 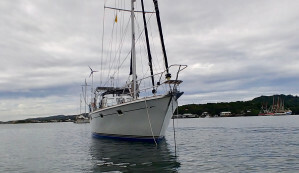 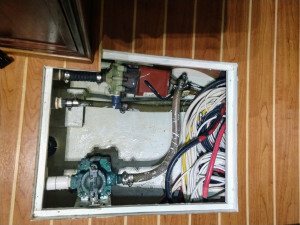 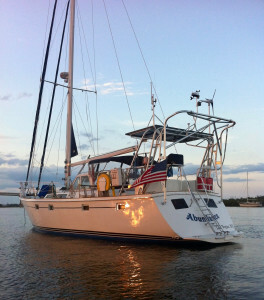 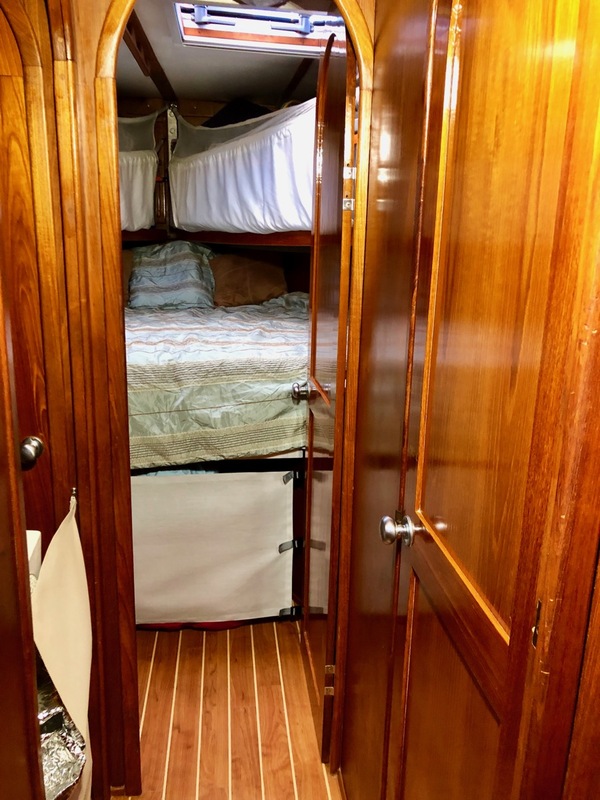 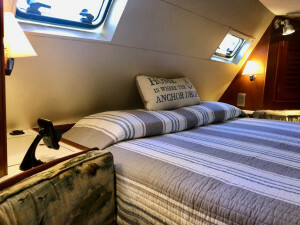 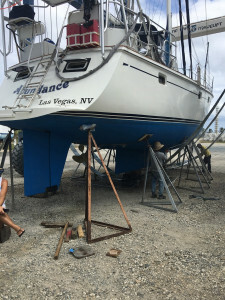 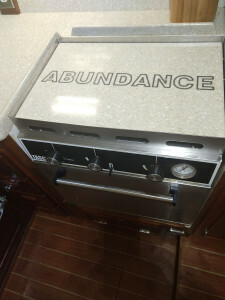 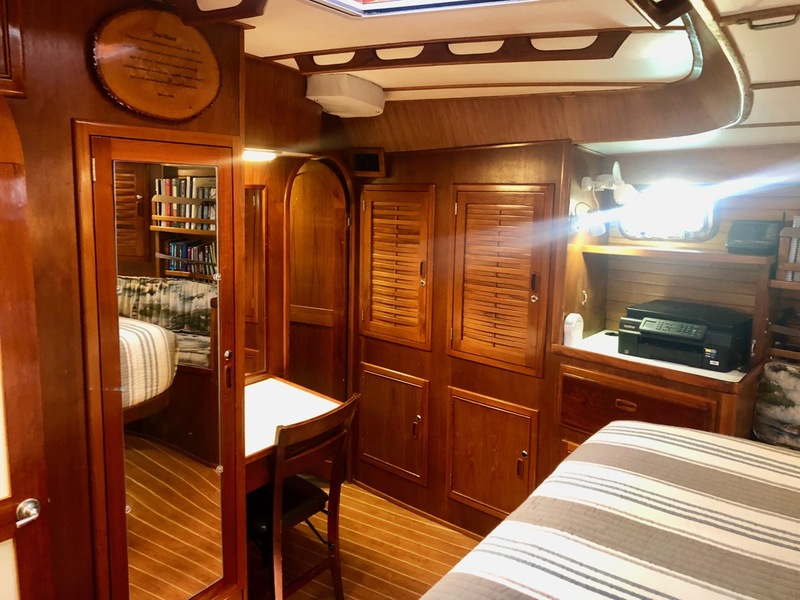 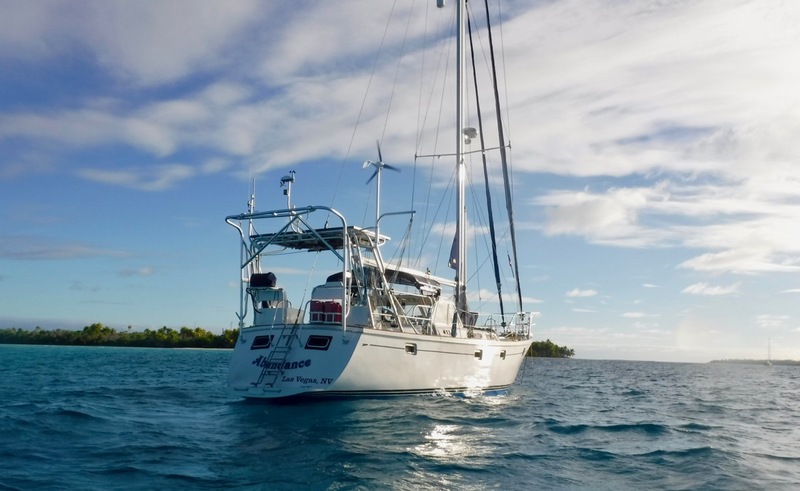 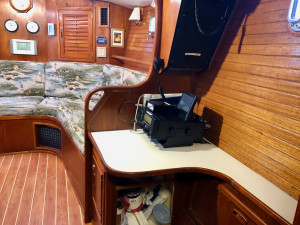 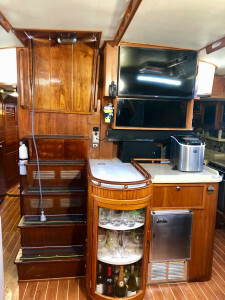 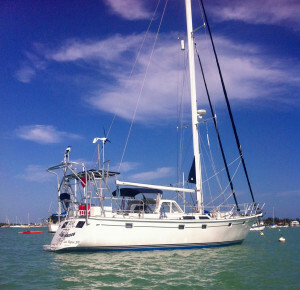 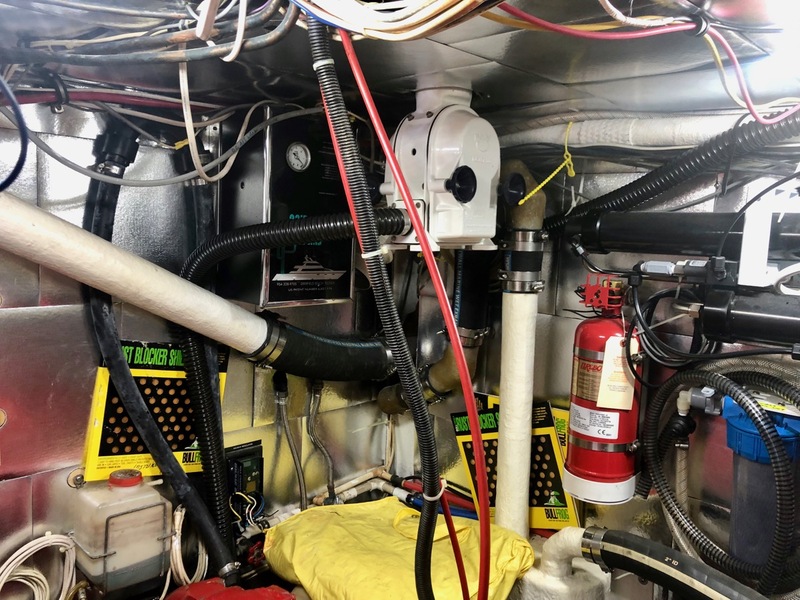 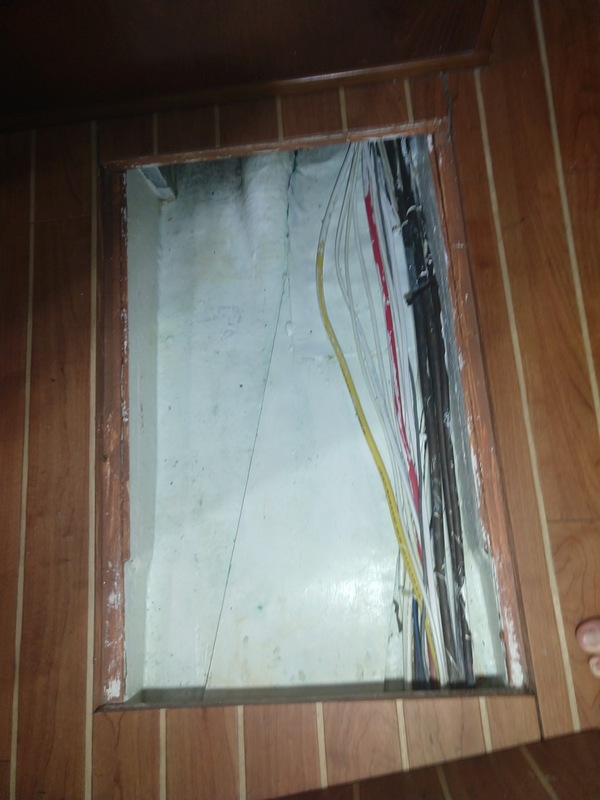 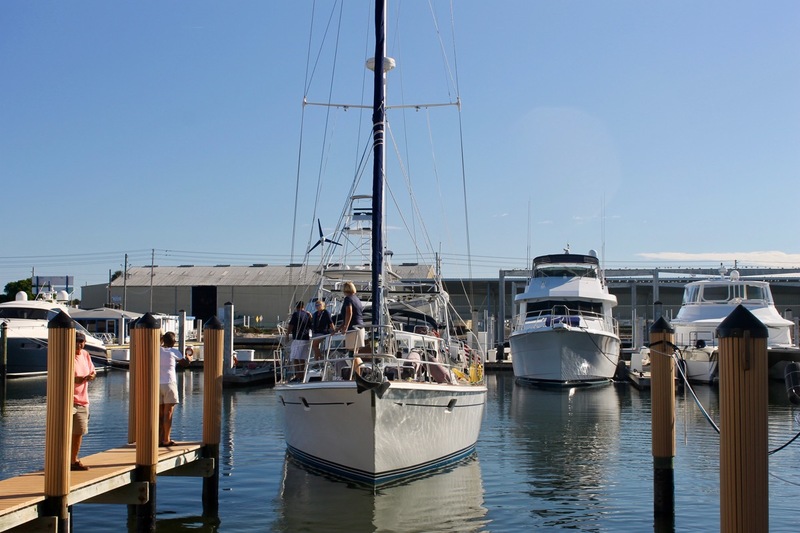 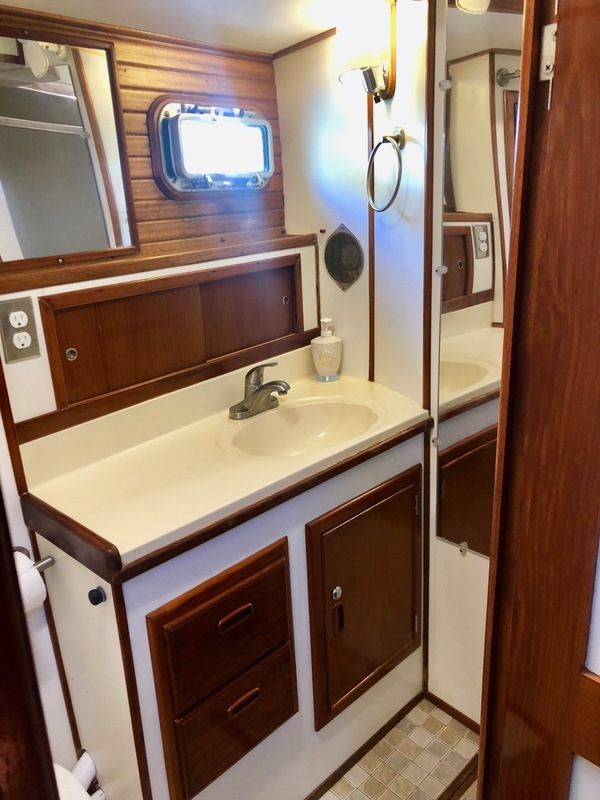 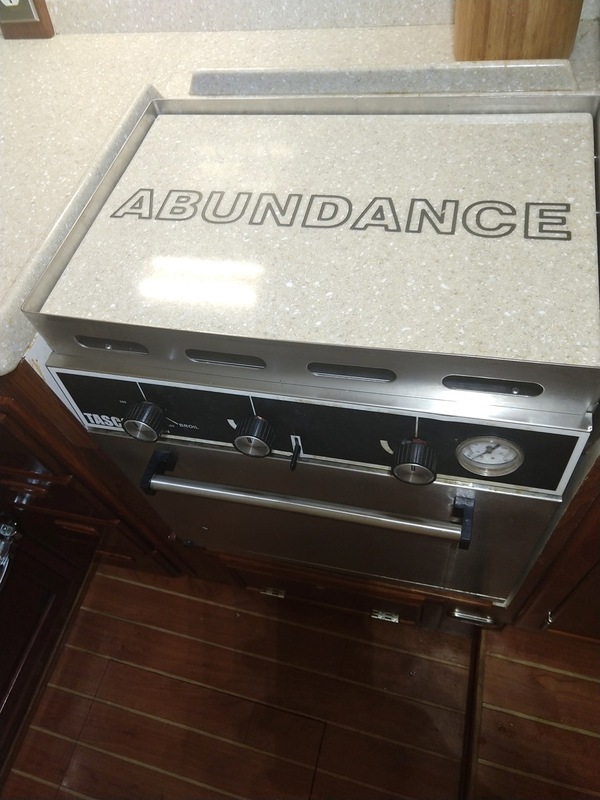 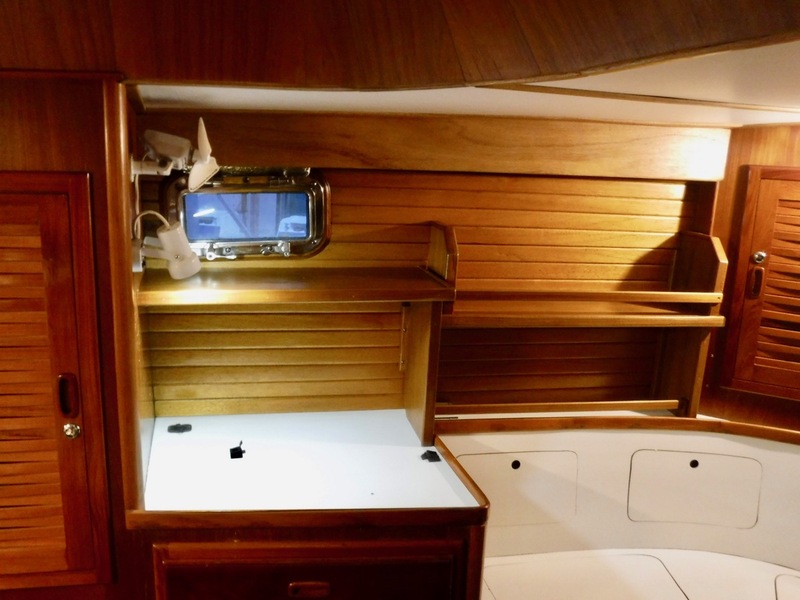 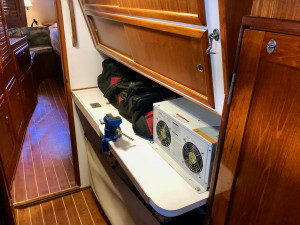 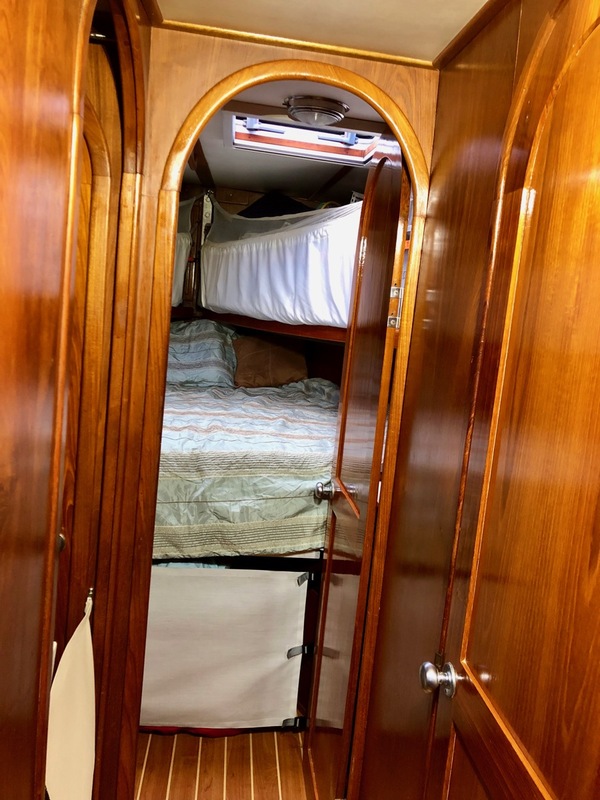 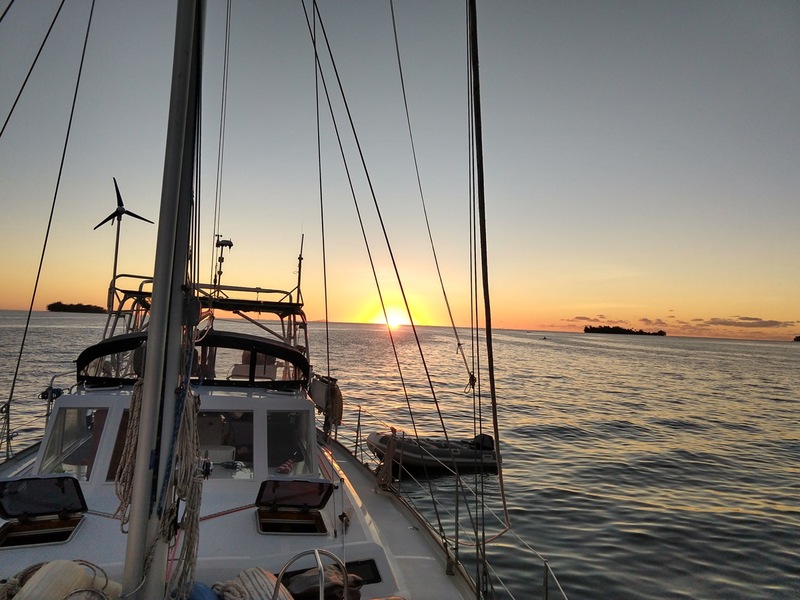 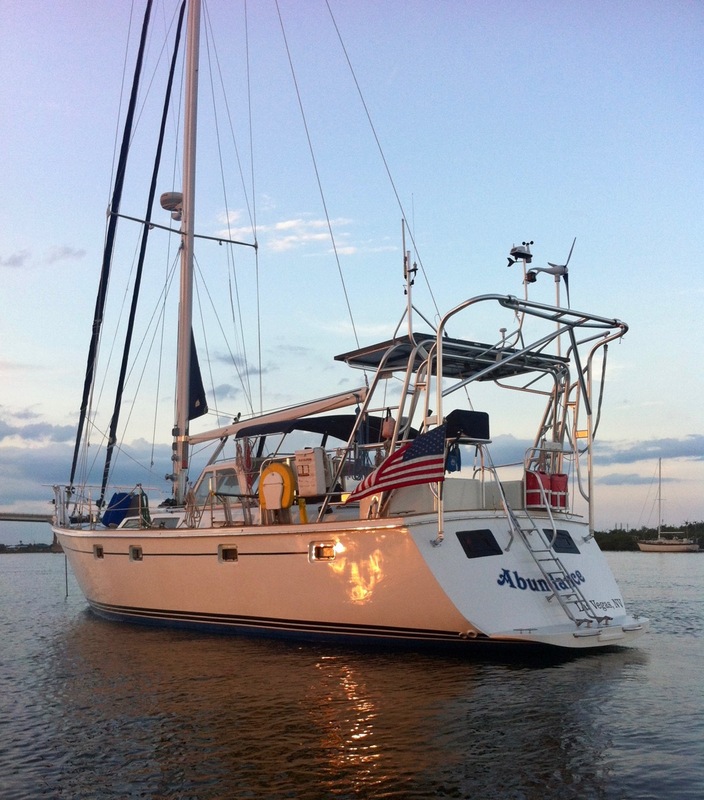 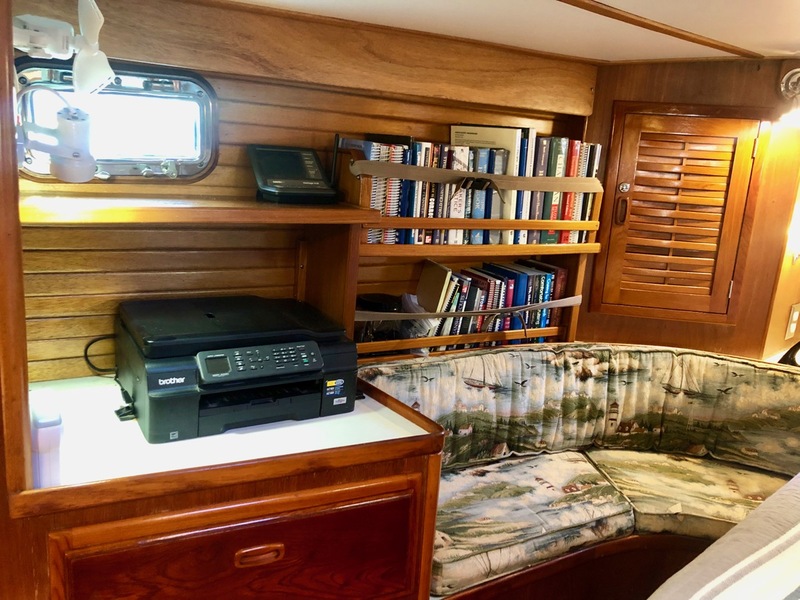 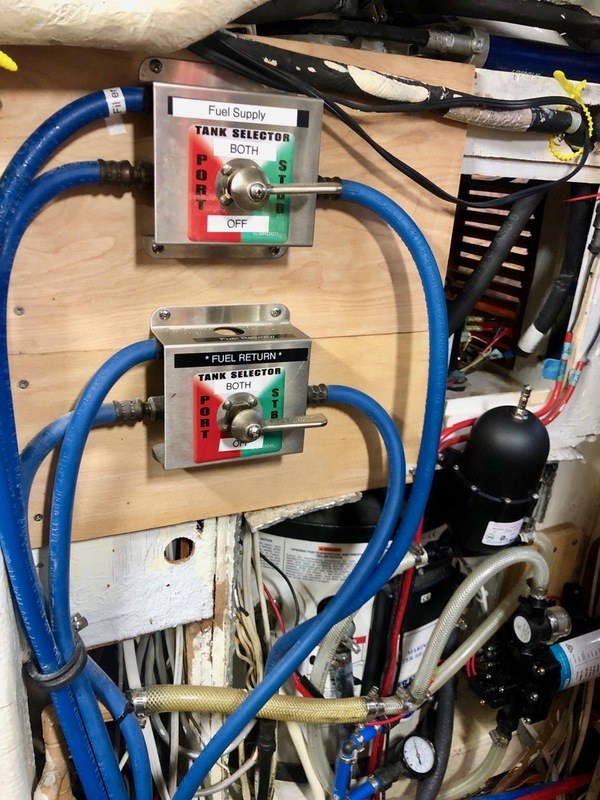 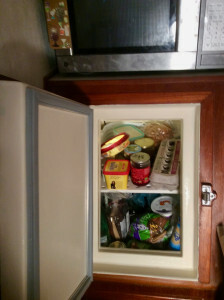 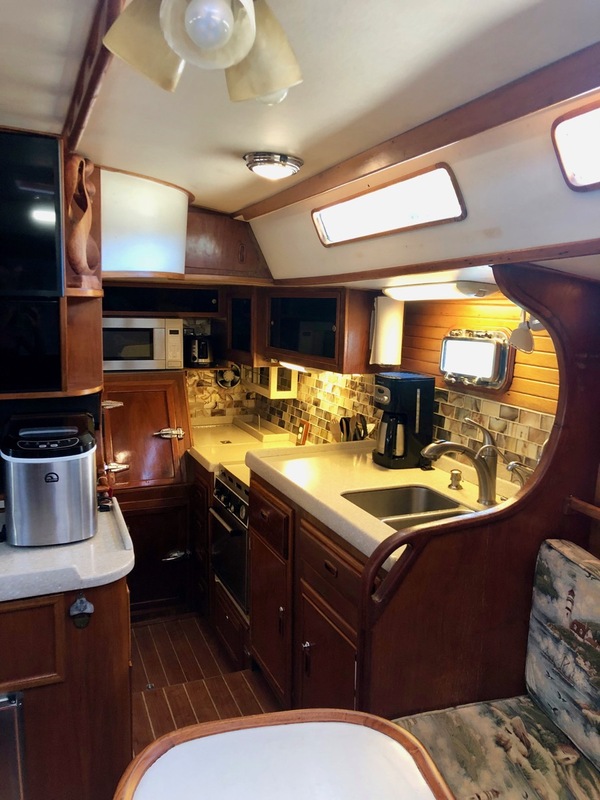 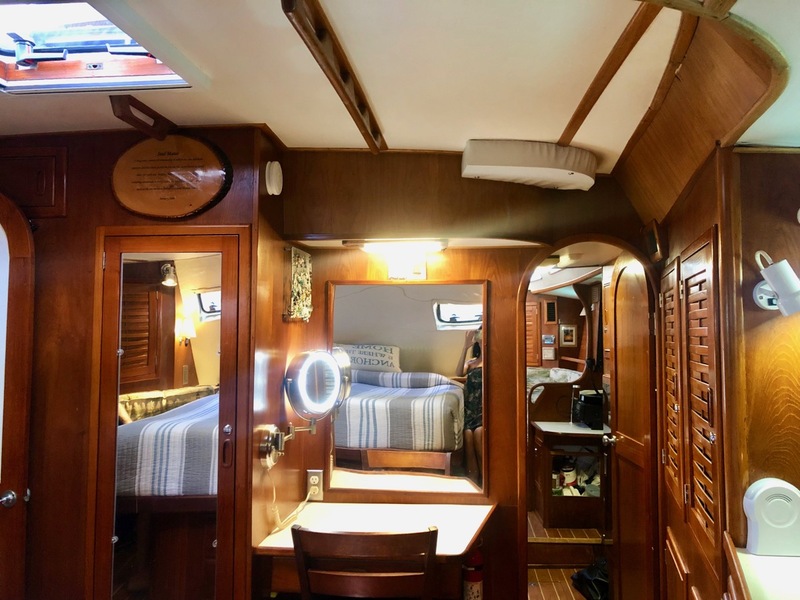 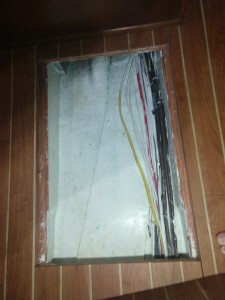 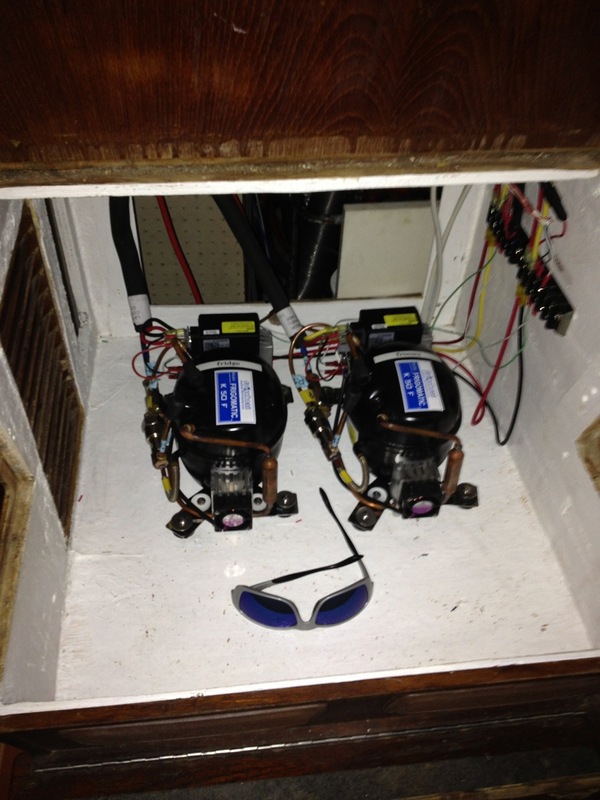 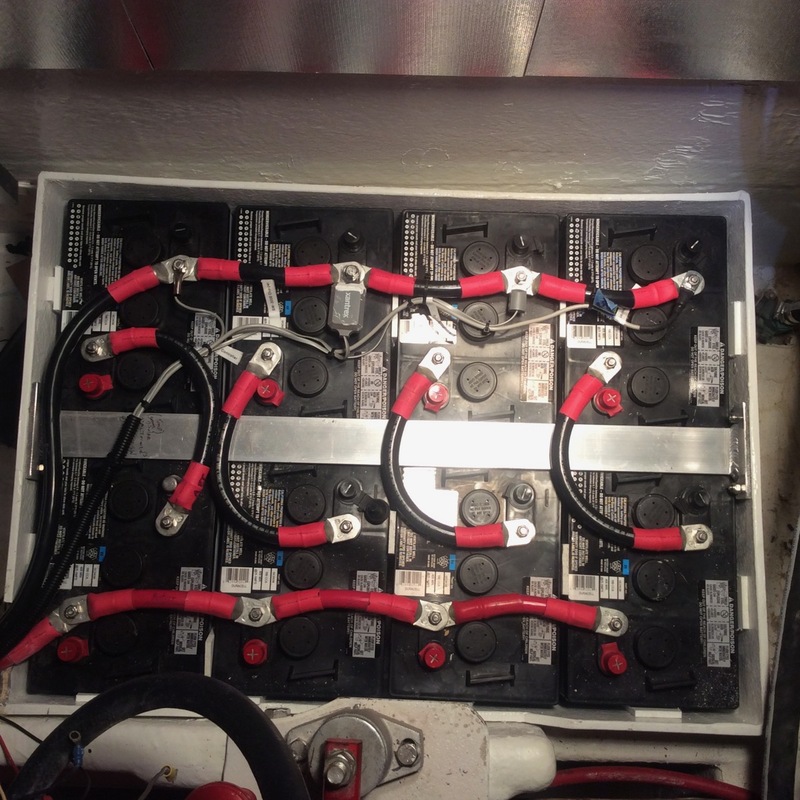 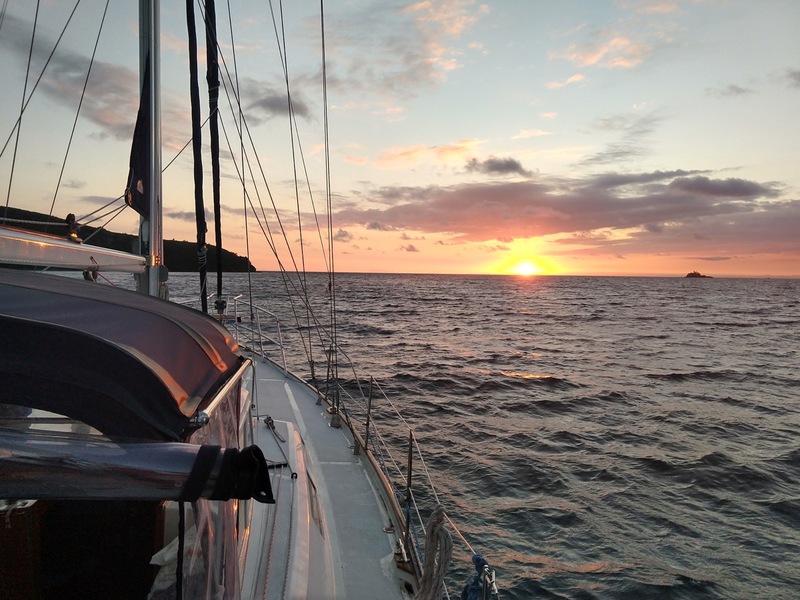 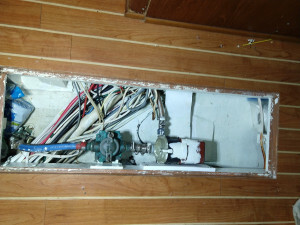 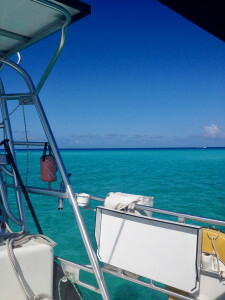 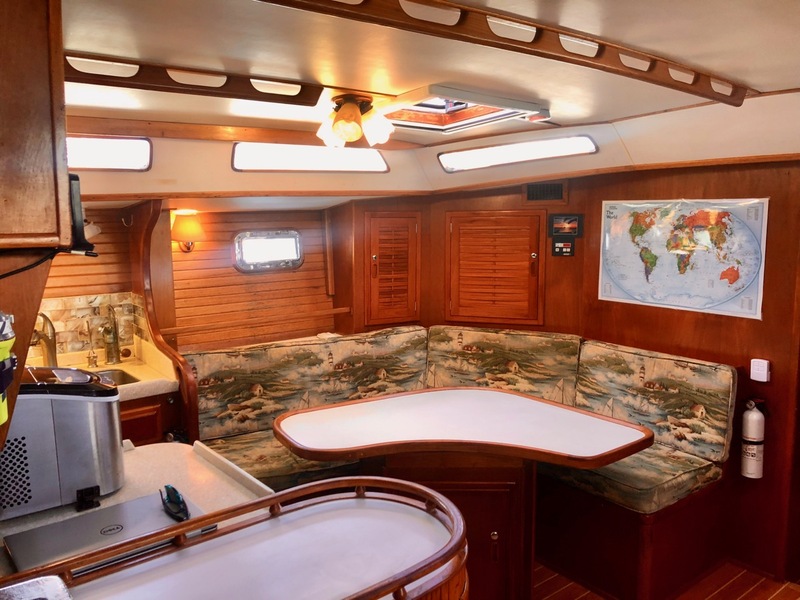 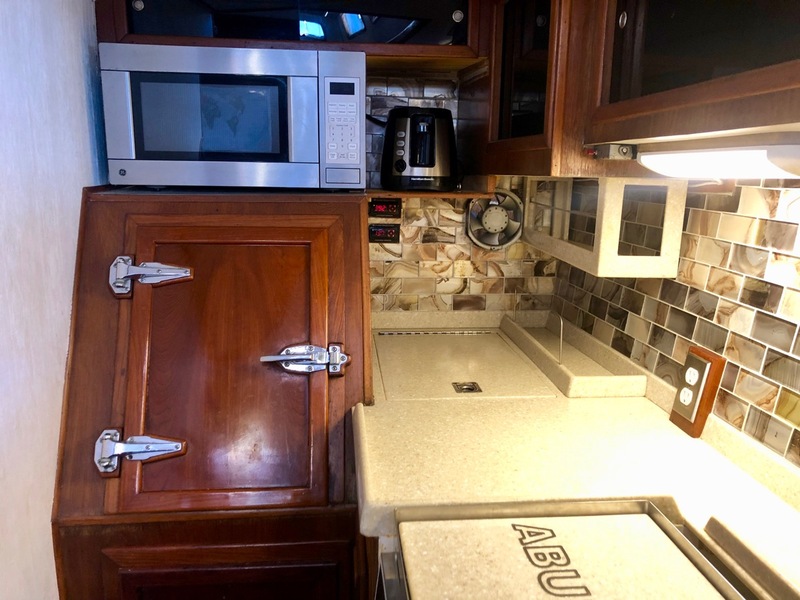 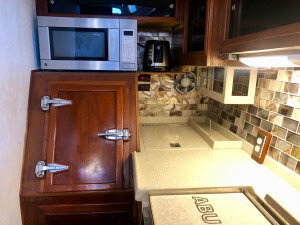 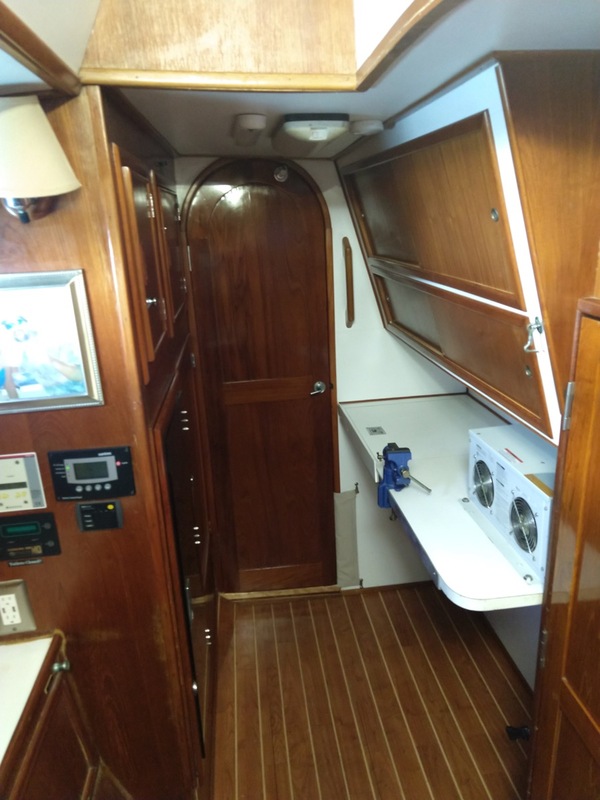 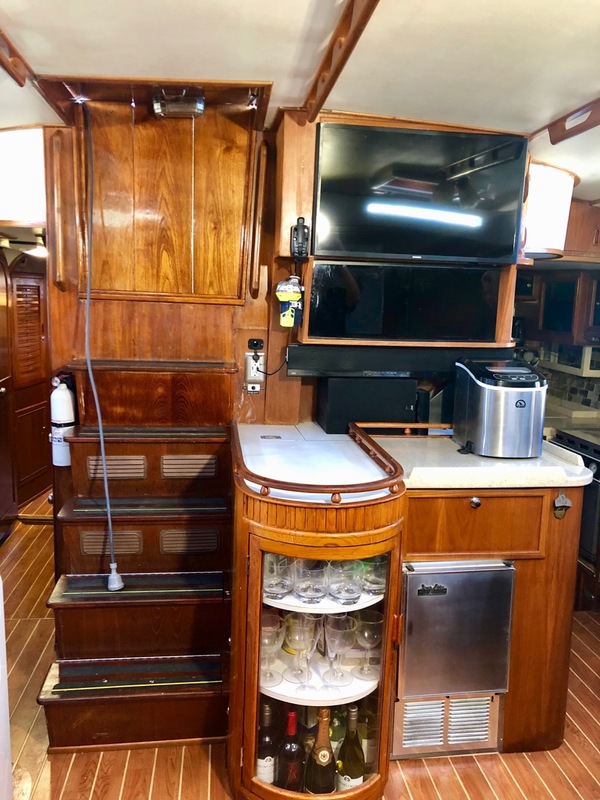 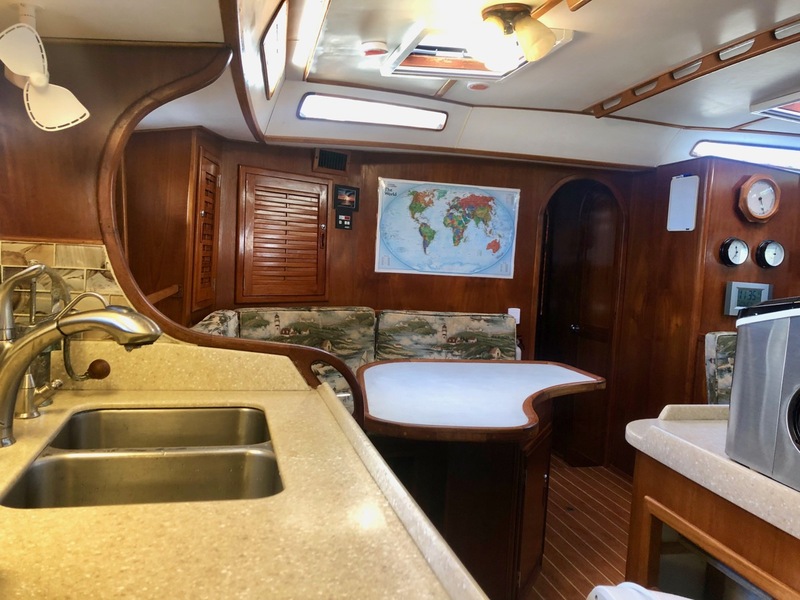 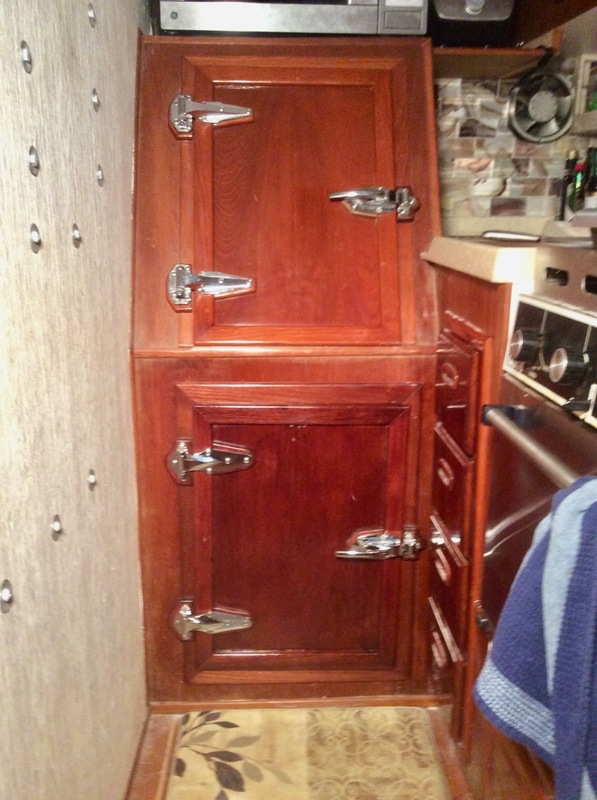 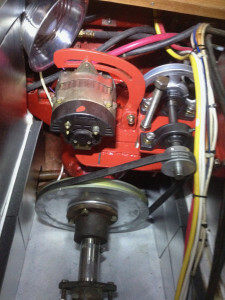 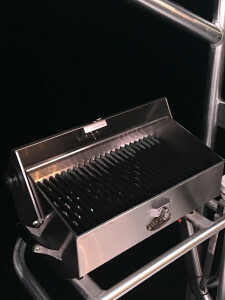 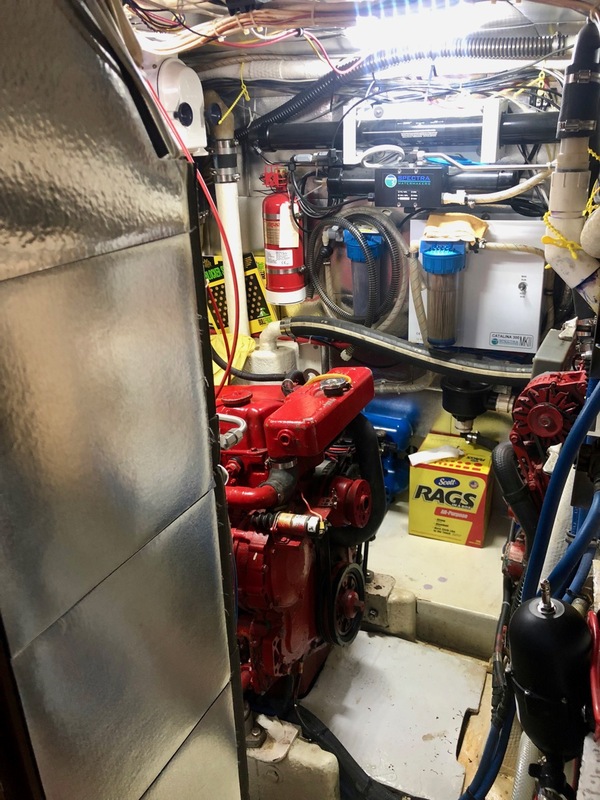 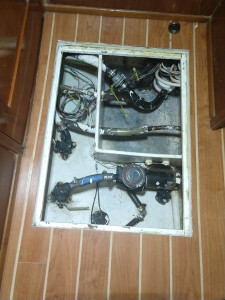 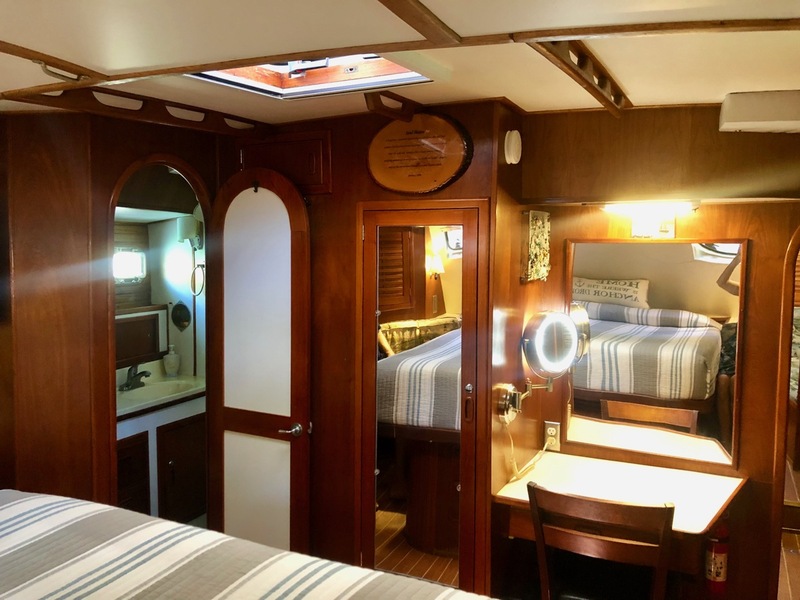 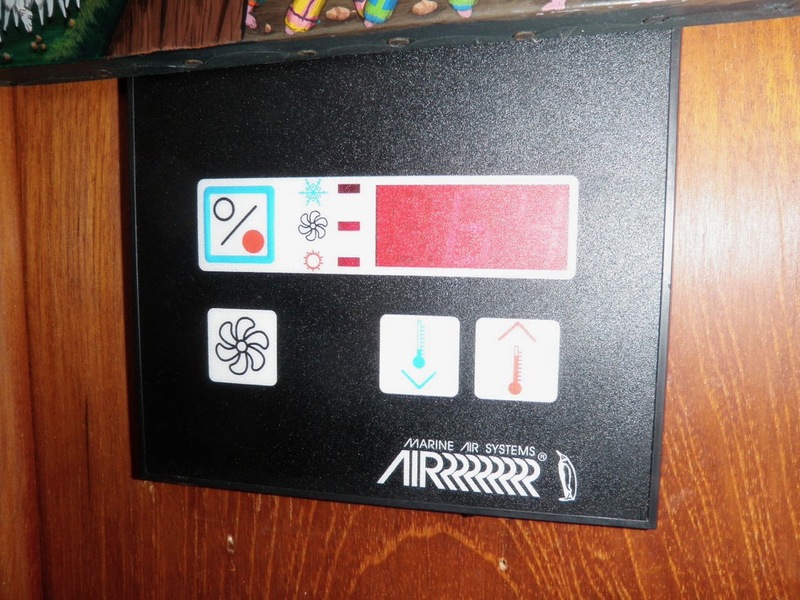 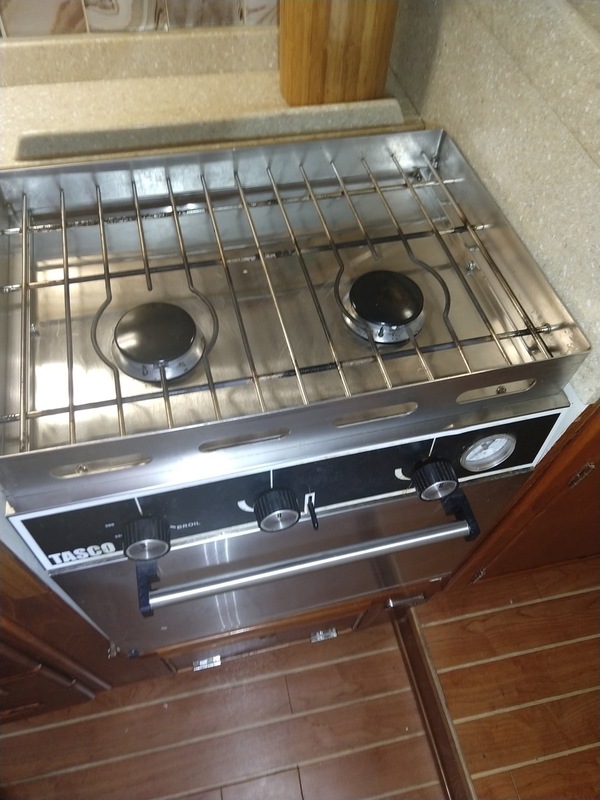 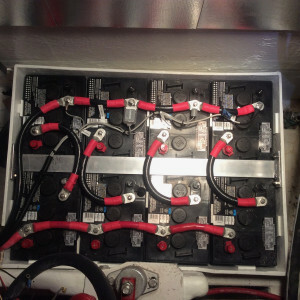 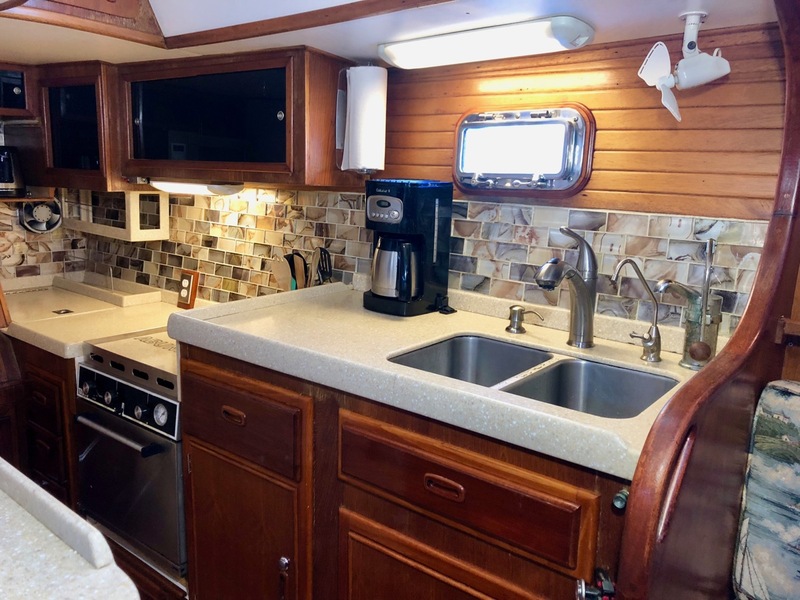 On board ‘Abundance’ safety is paramount, so the boat is fitted with Two-station propane leak detector, at tanks on aft deck and under stove in galley and an electric solenoid switch at galley integrated into S2A warning panel for added security. 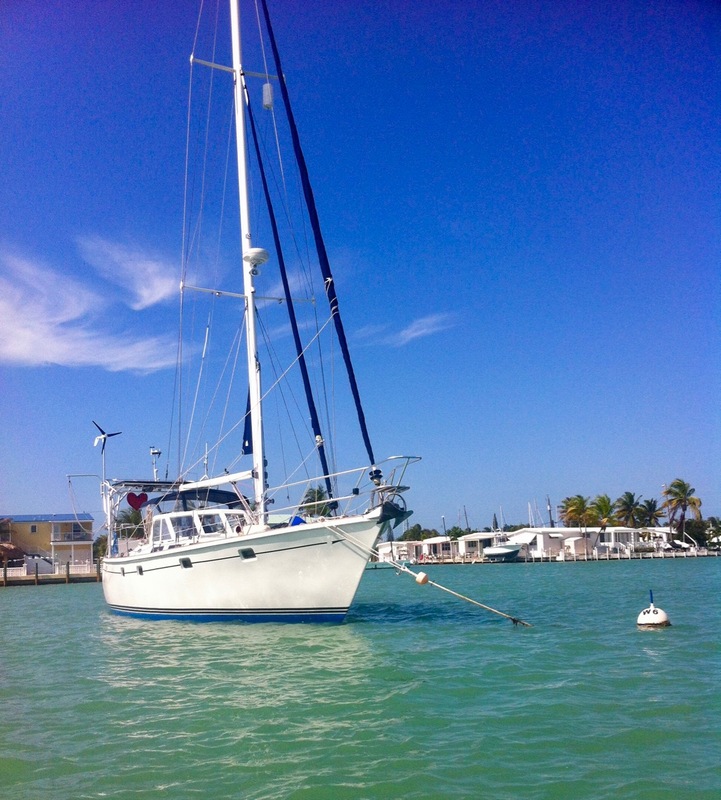 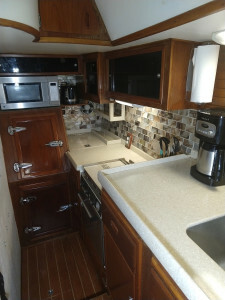 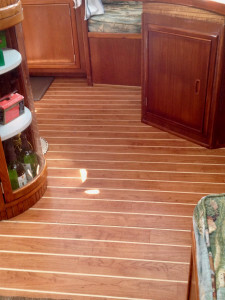 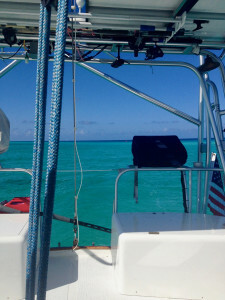 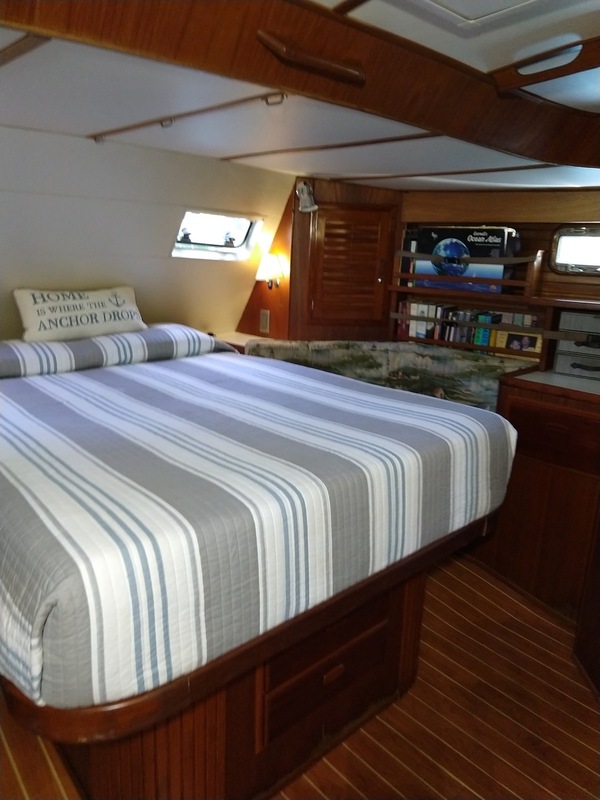 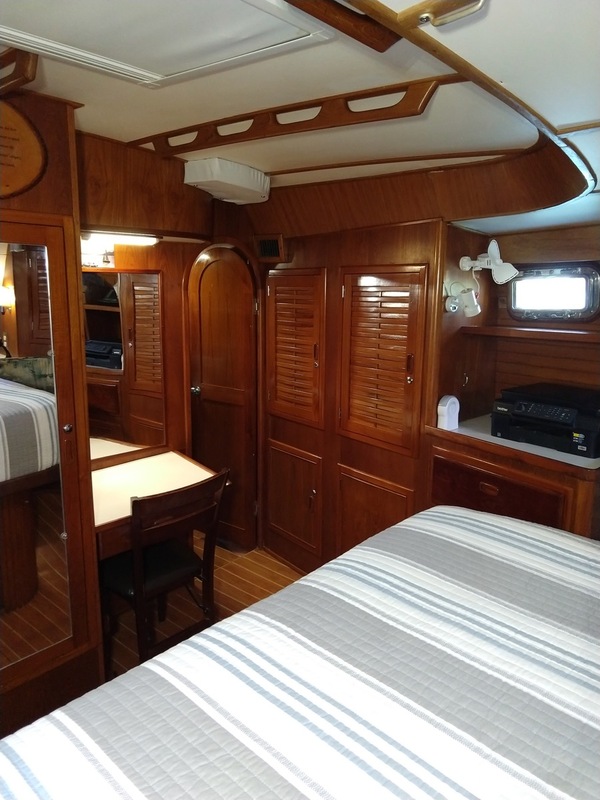 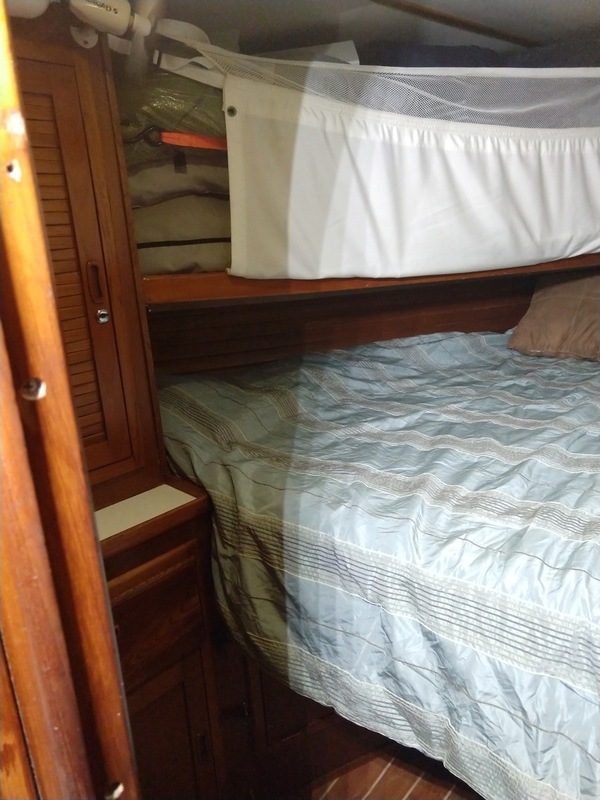 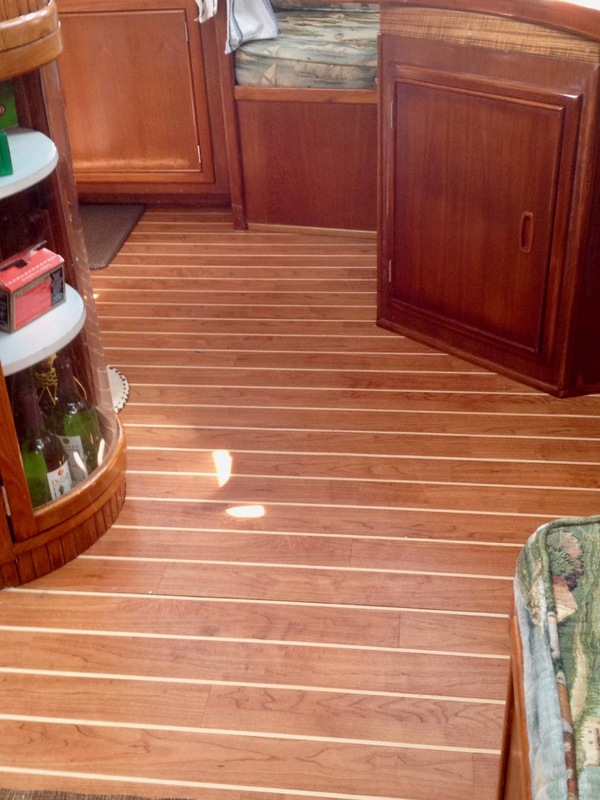 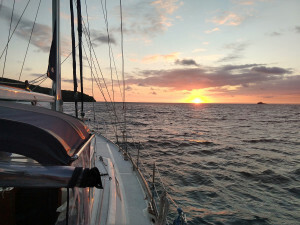 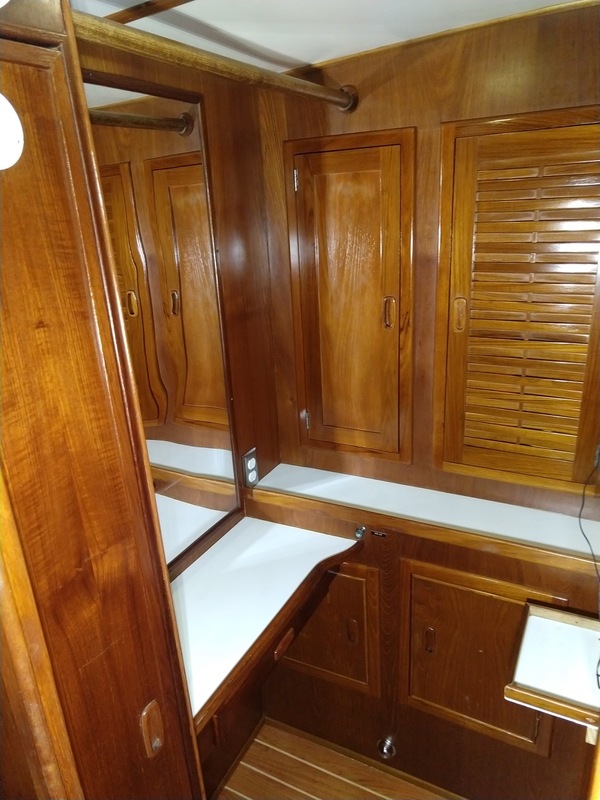 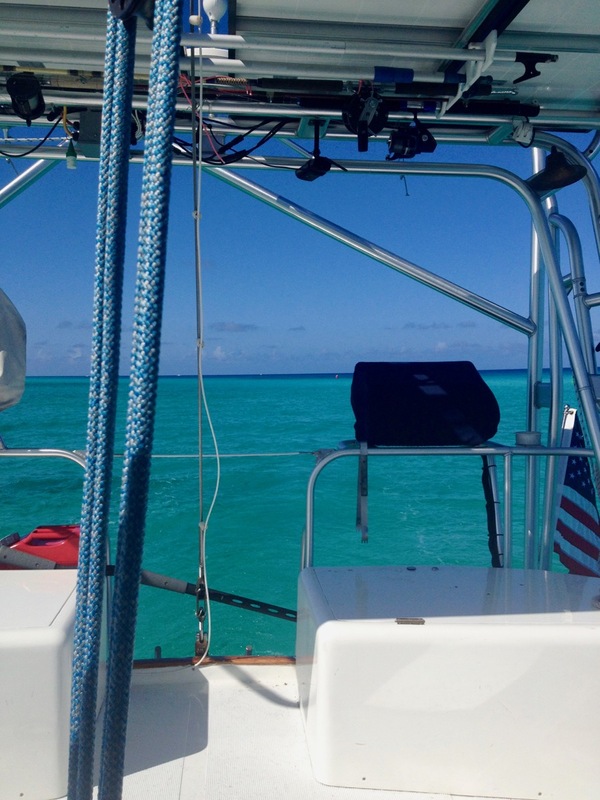 One of the best feature on this boat is the absolutely royal owner stateroom situated aft of the companionway. Occupying almost a third of the vessel it is almost an apartment in itself, with a queen size island berth fitted with a very comfortable custom mattress in memory foam, vanity with mirror, flat screen TV mounted on the wall, ample storage for hanging and folded clothes and access to the owner’s ensuite, which is large, well ventilated, and equipped with electric toilet and a full walk-in shower. 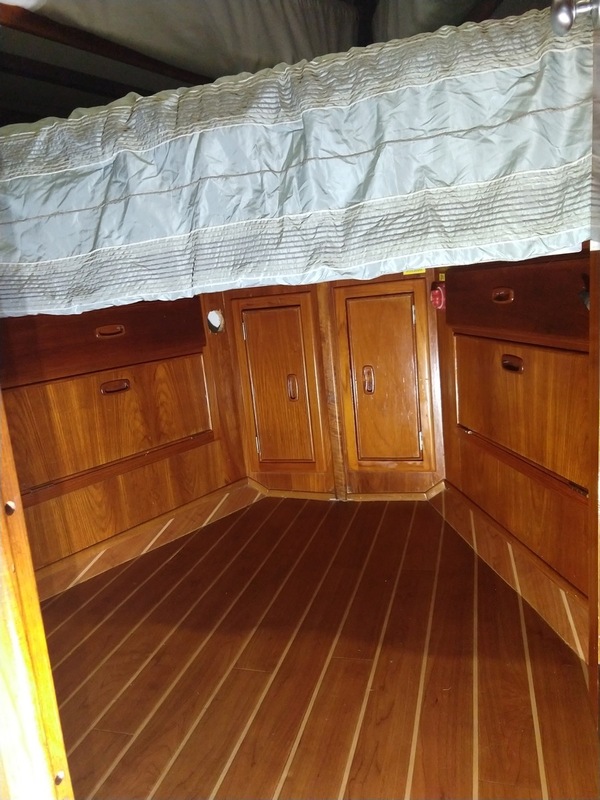 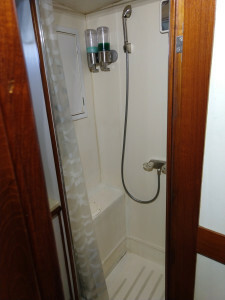 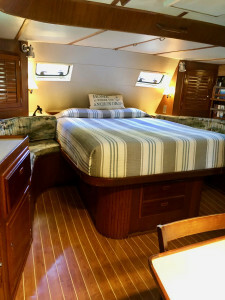 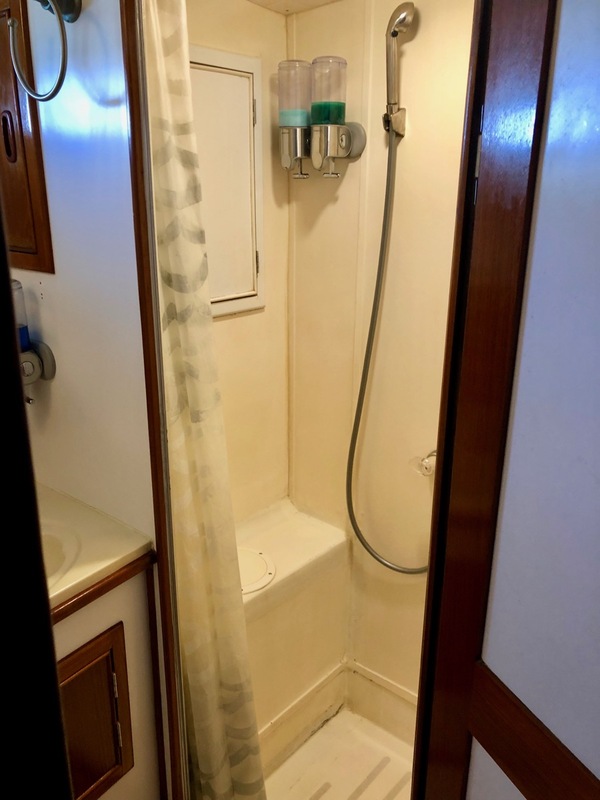 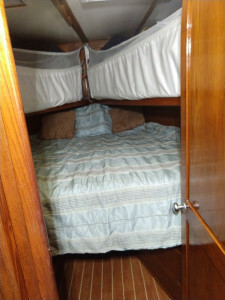 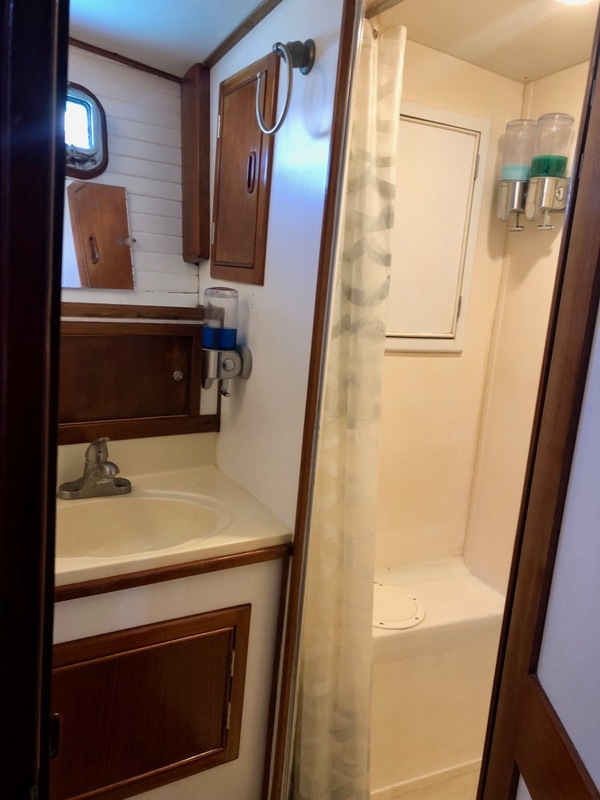 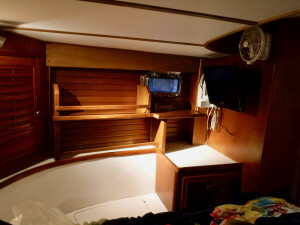 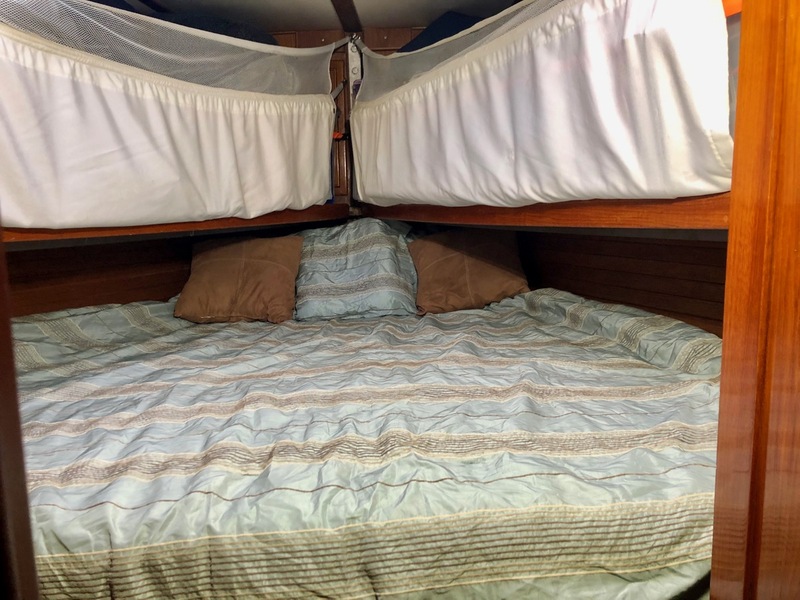 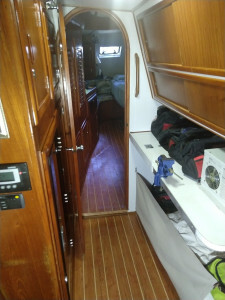 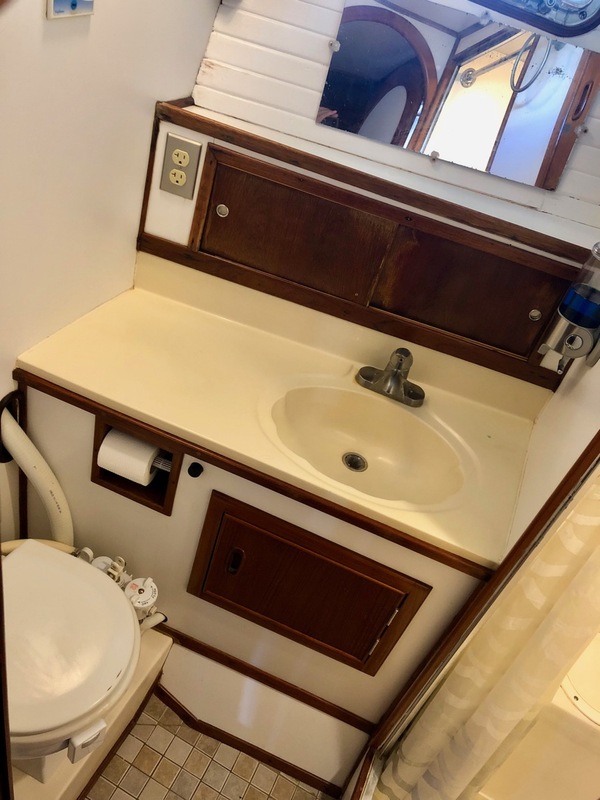 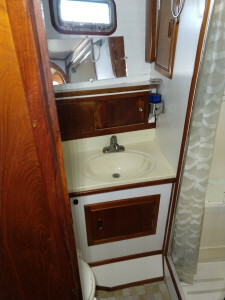 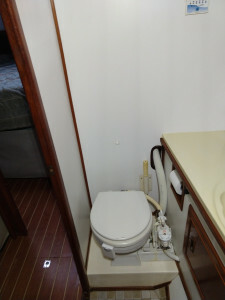 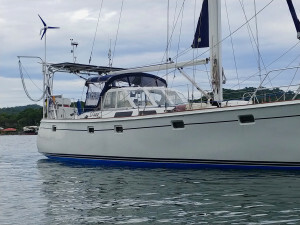 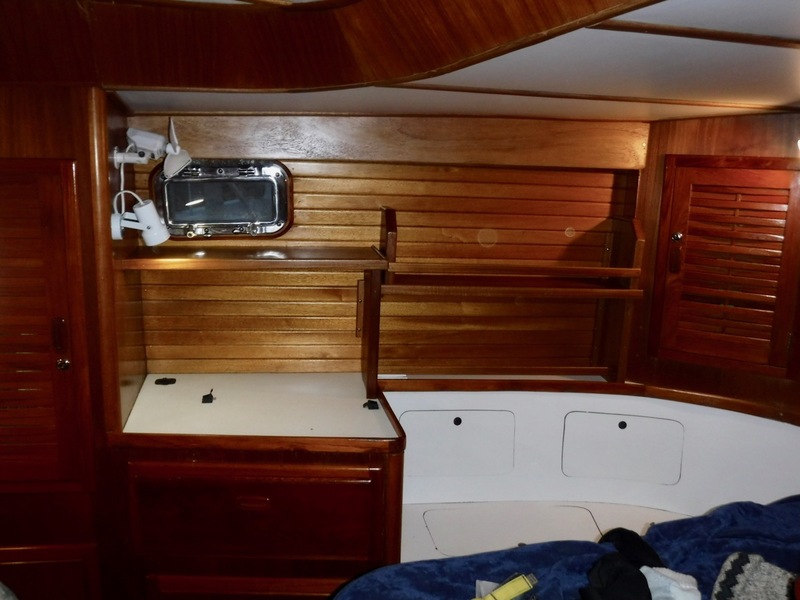 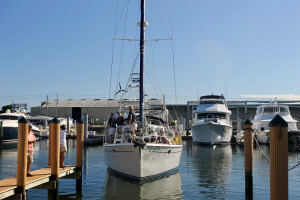 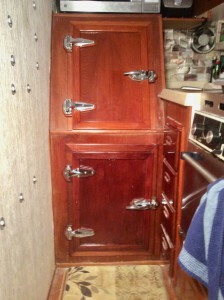 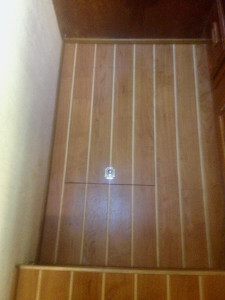 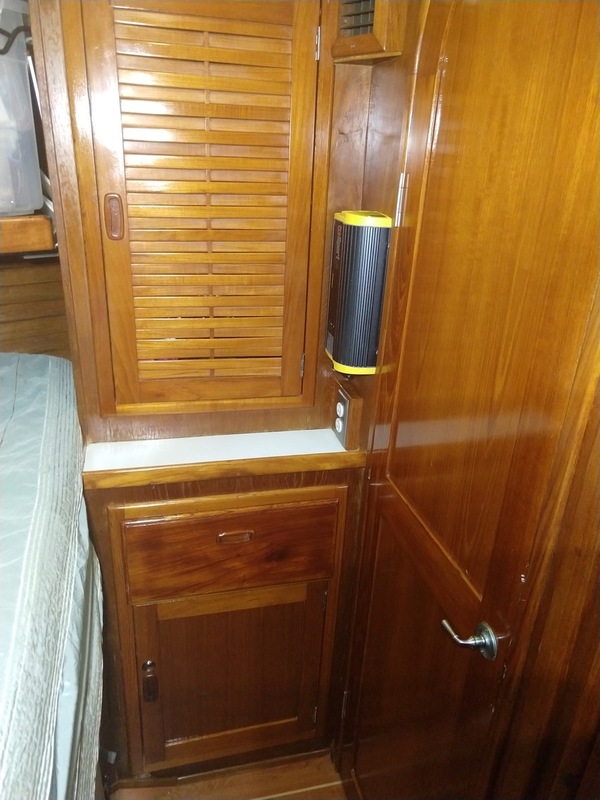 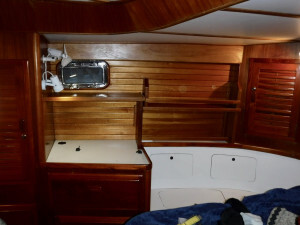 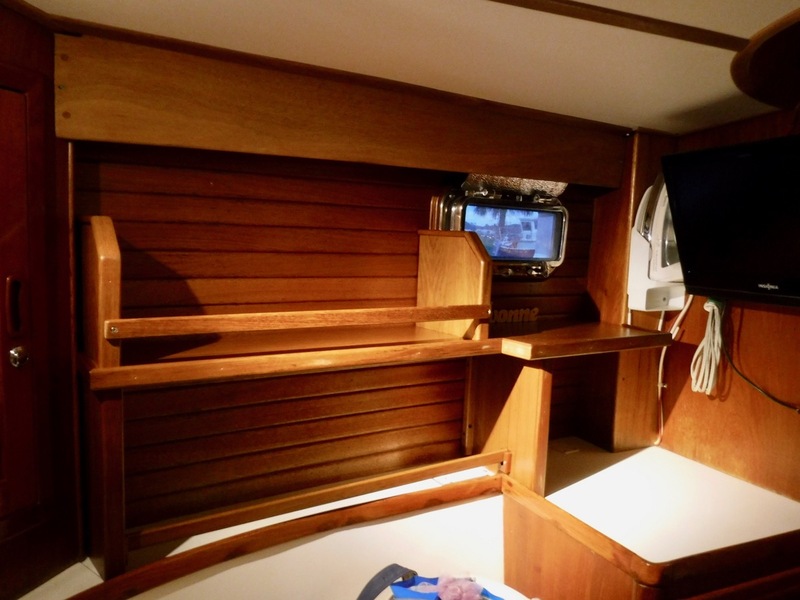 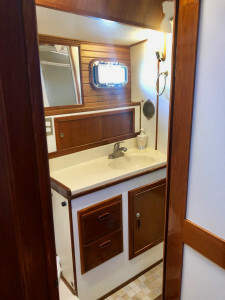 For maximum privacy and to make better use of the space on board, ‘Abundance’ as many US designed yachts, only has one other cabin, which is at the other end of the boat in the bow, and which has a very large double berth and is adjacent another full-size head area with electric toilet and walk-in shower and vanity with mirror. 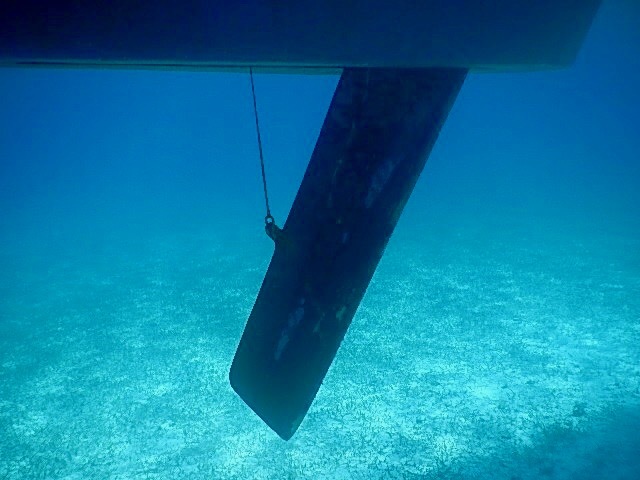 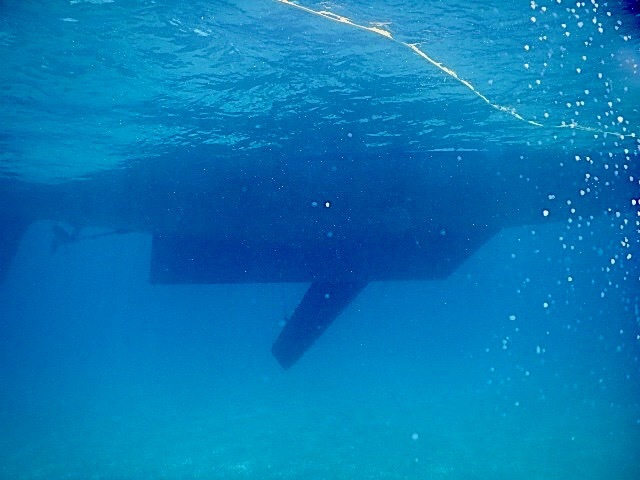 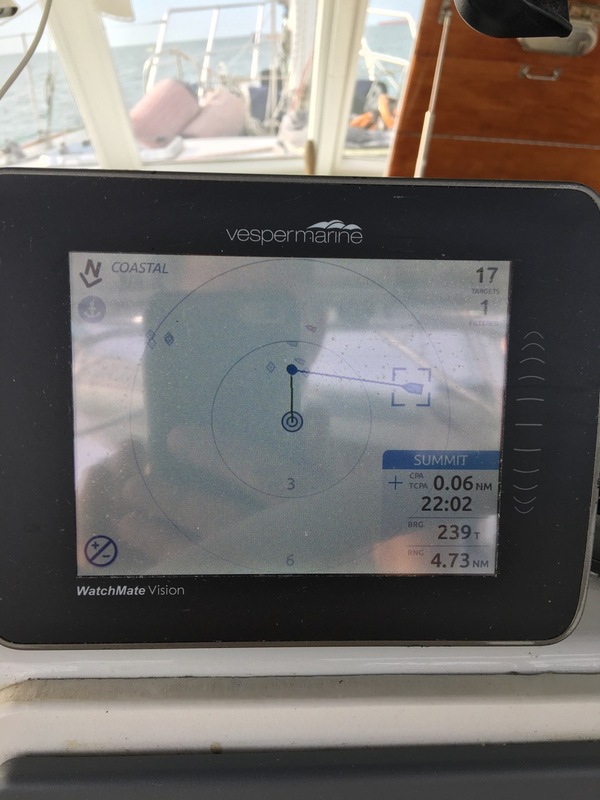 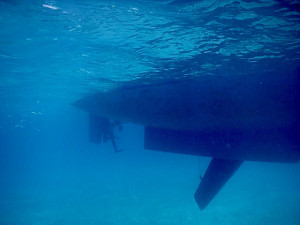 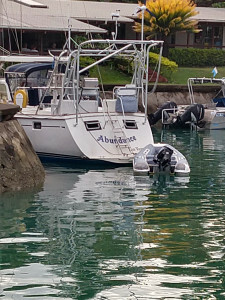 Going back to a more technical subject, ‘Abundance’ is again equipped as a veritable superyacht, which every electronic short of a forward-looking sonar (although there is a fish finder that shows a very good underwater relief) All the details for the equipment regarding the electronics, electrics and other equipment / inventory are listed in details in our brochure. 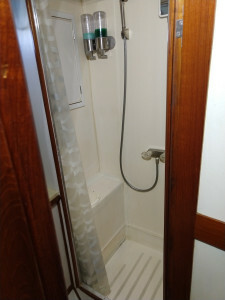 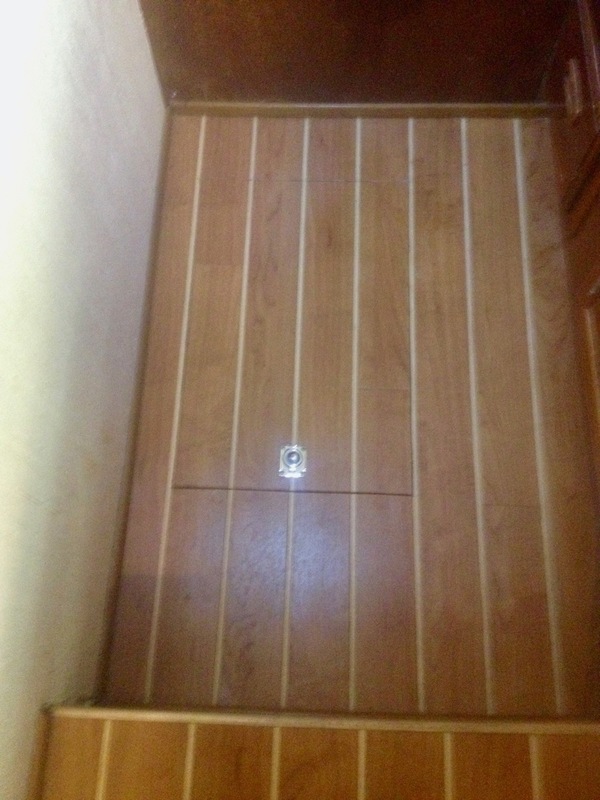 Price Base : USD195,000 Neg.